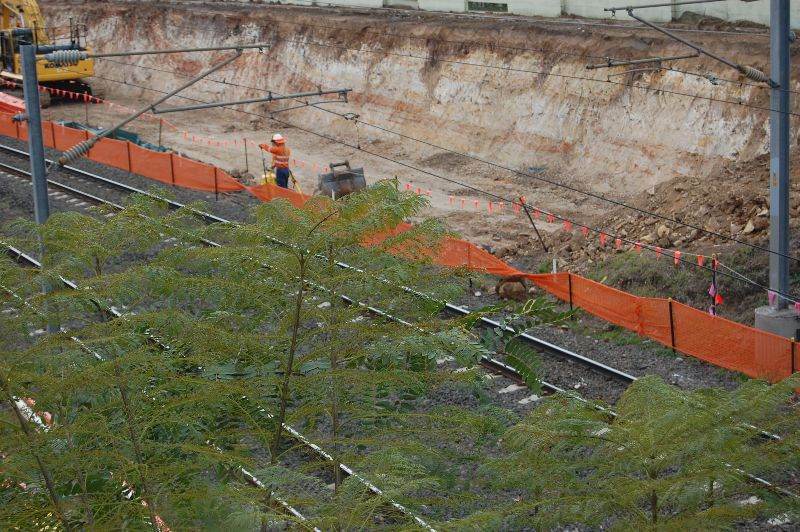 Corinda yard is virtually gone. 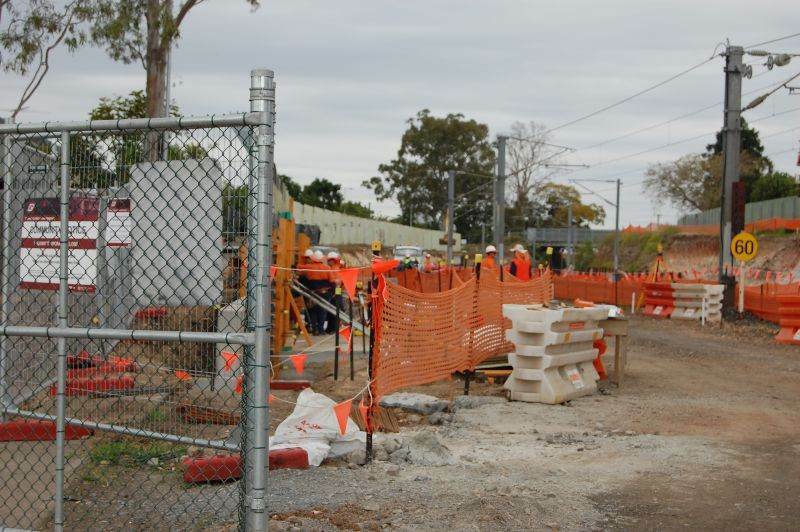 The main project site office takes up a bit. 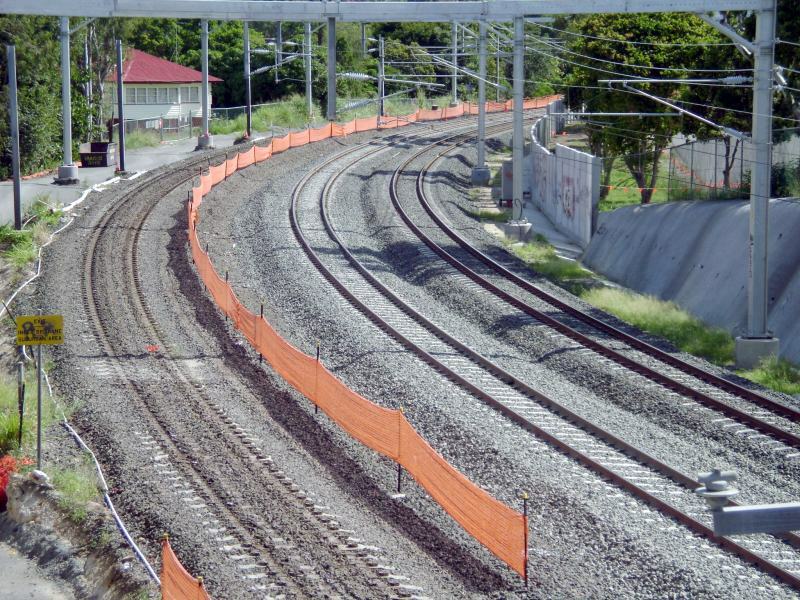 A new line will be constructed to the south of platform 1 road. 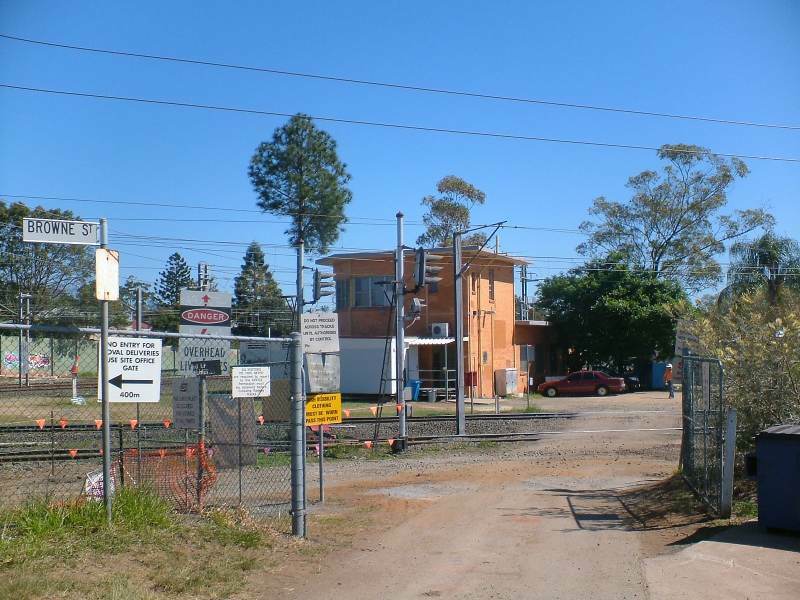 Couple more photographs today at Corinda. 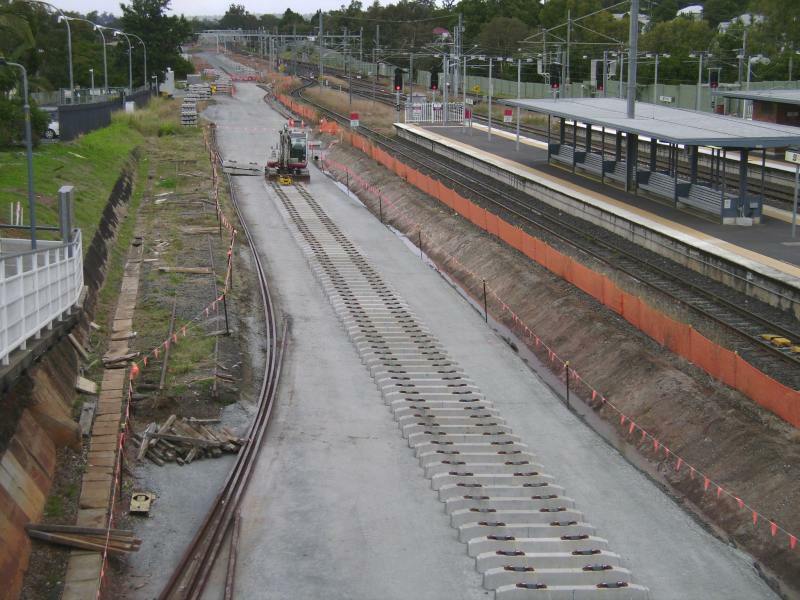 The yard track is all pulled up, piles of sleepers. 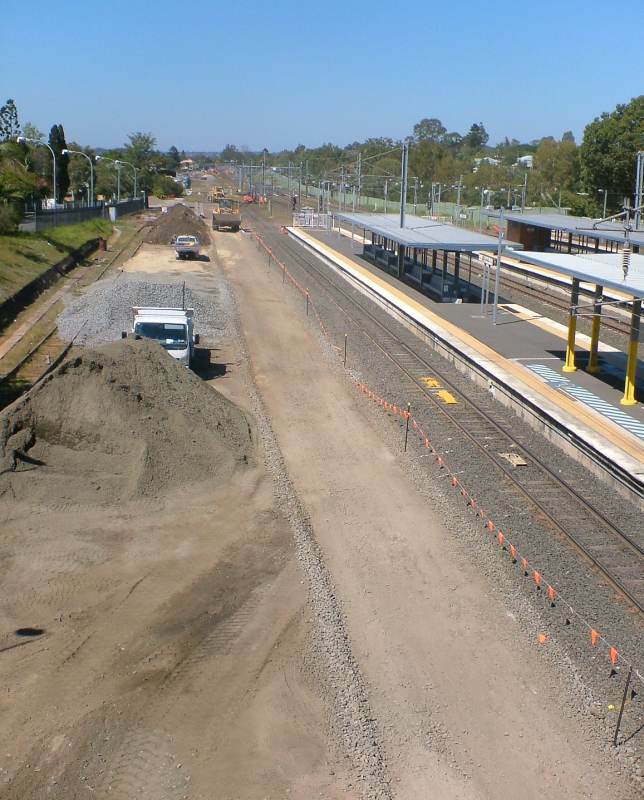 Corinda service via Tennyson shortly after arrival at 4.01pm. 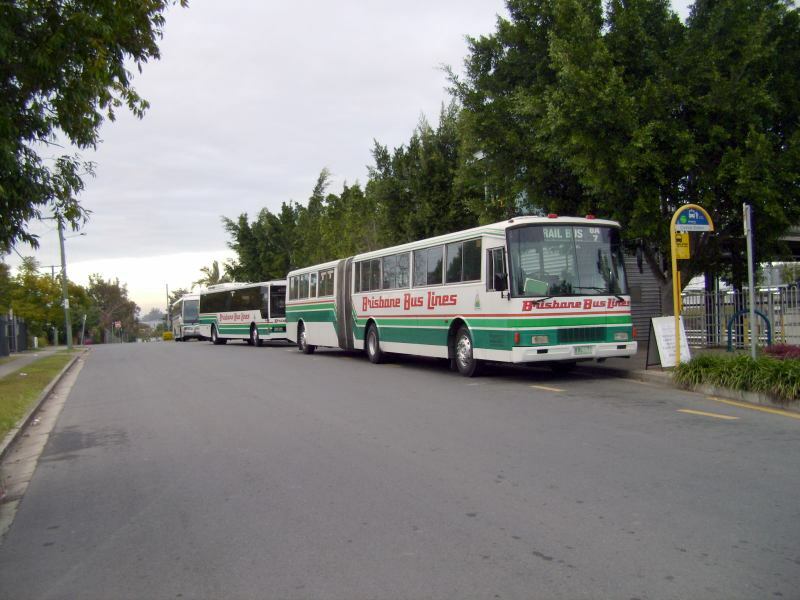 I travelled on this service, moderate loading (2). 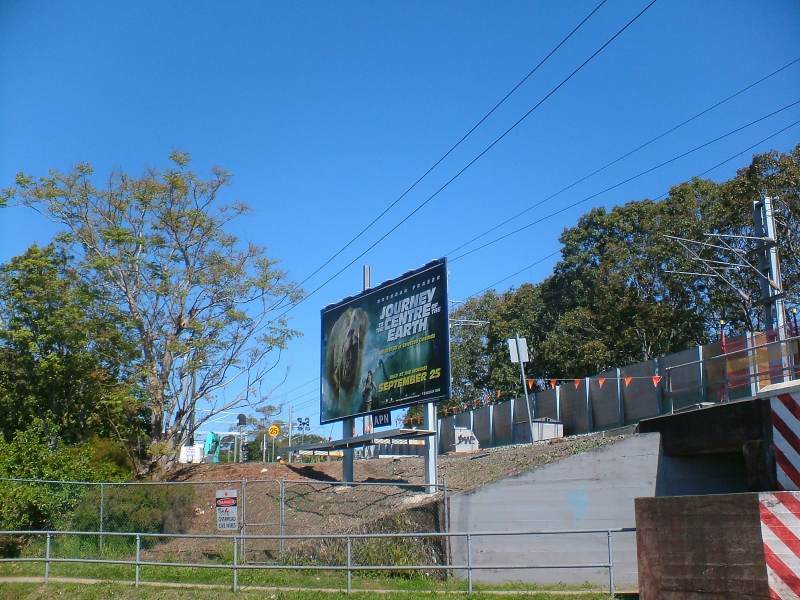 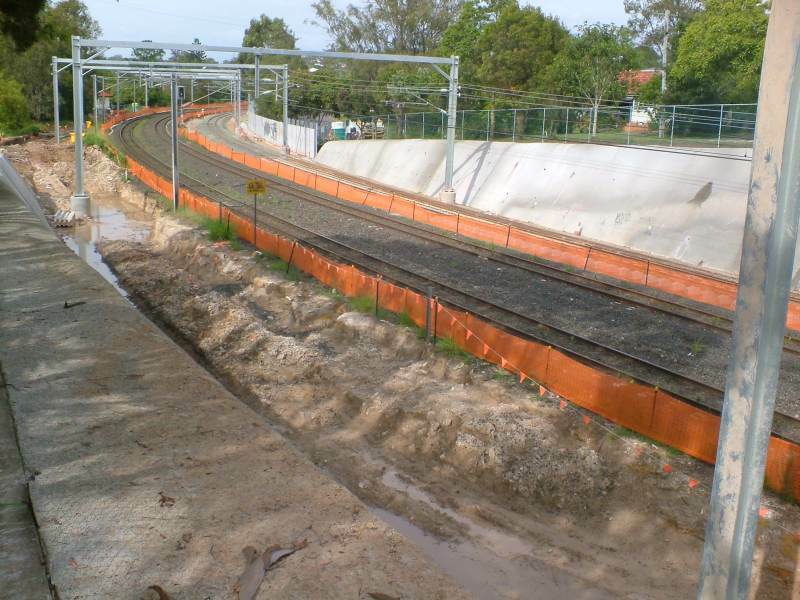 Photographs from the Cliveden Avenue Bridge between Corinda and Oxley on the main line. 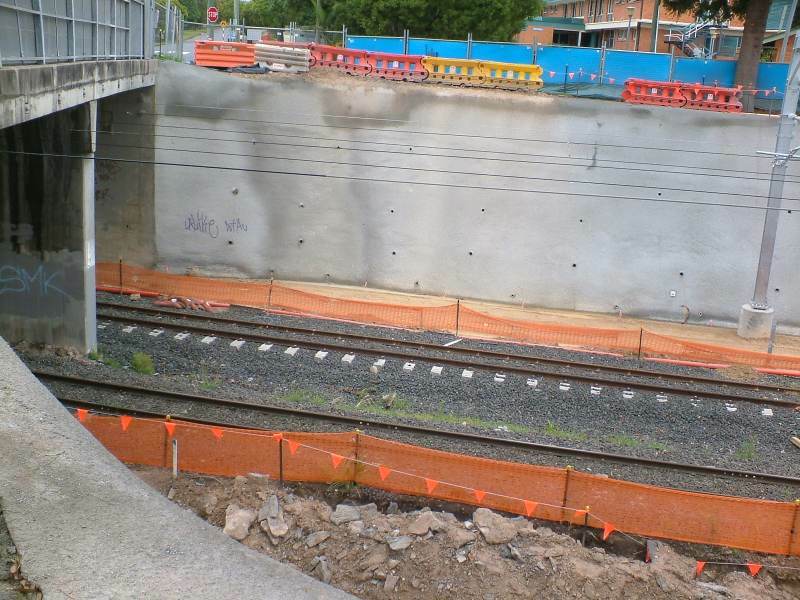 down side between Oxley and Corinda. 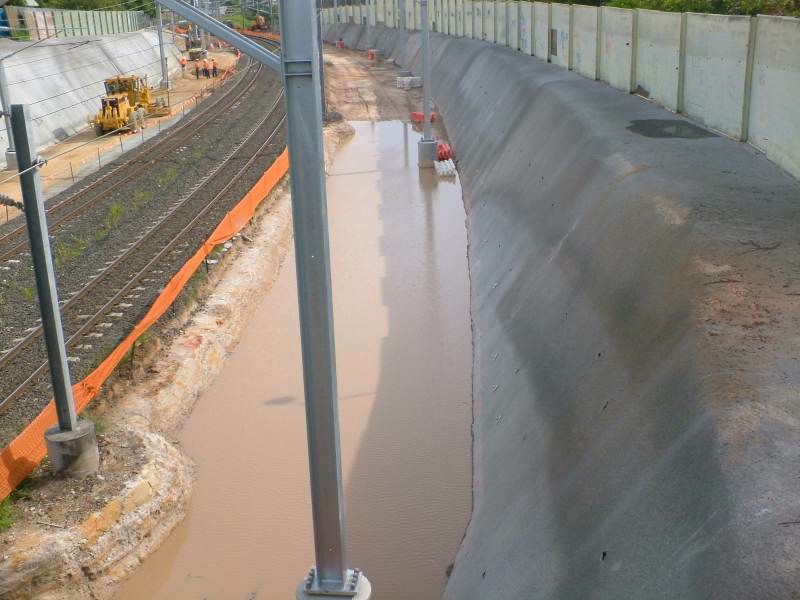 Work progressing steadily, photographs from the Cliveden Avenue road bridge. 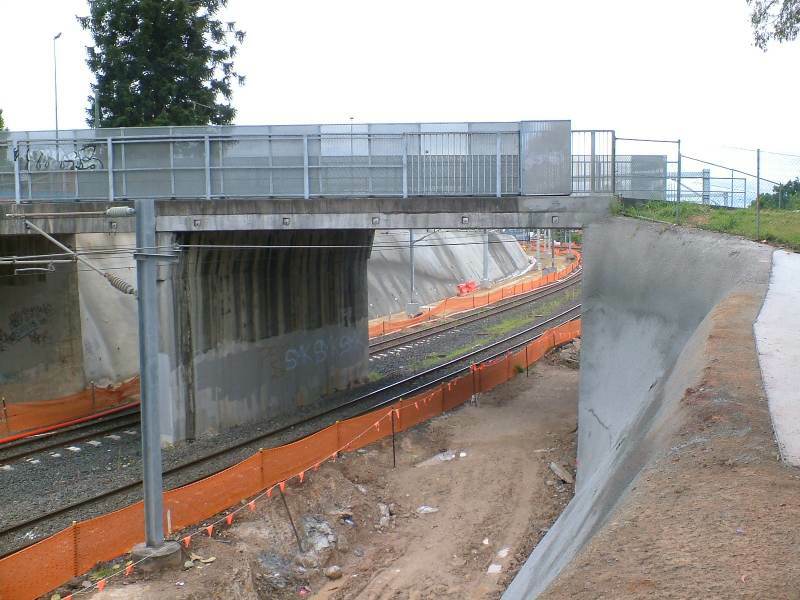 Checked out the Cliveden Avenue road bridge. 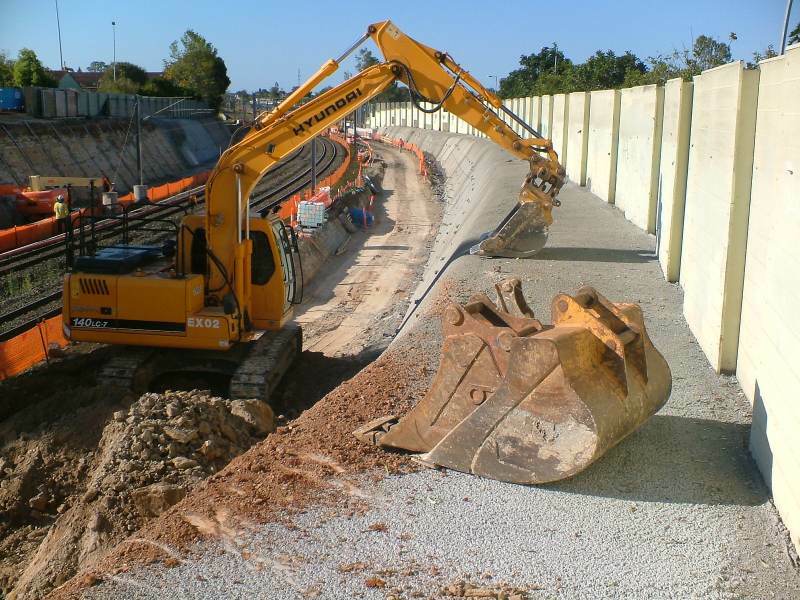 Work proceeding to clear the soil right up and under the bridge. 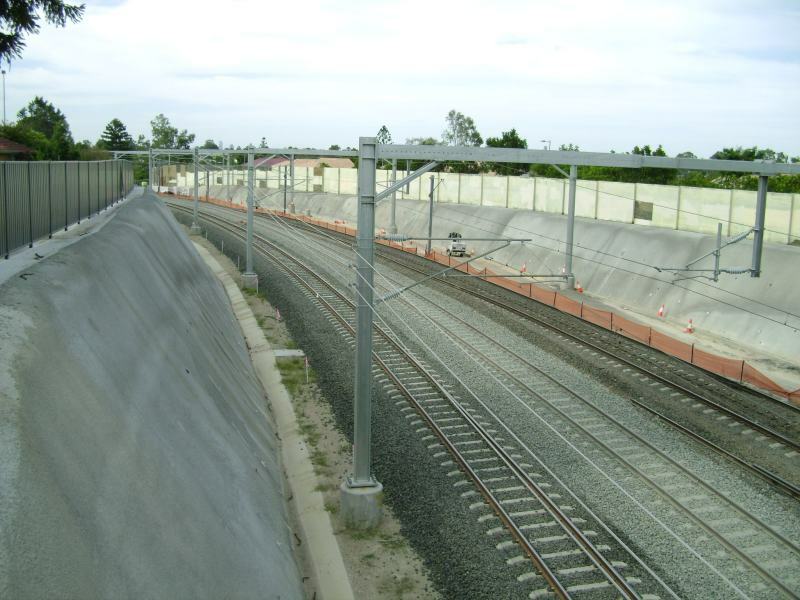 Also noted a number of 4 track overhead wire supports in place between the bridge and Oxley too. 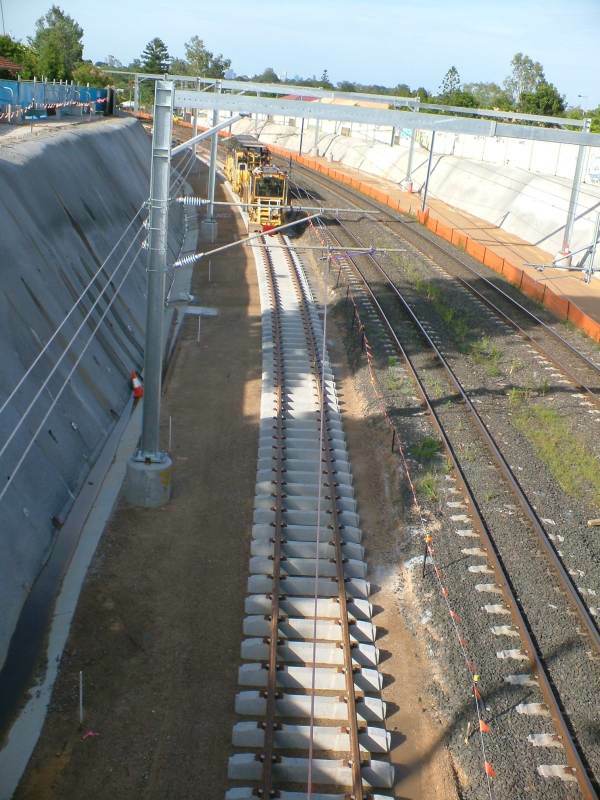 Points for the new freight line (4th line) put in place over the weekend. 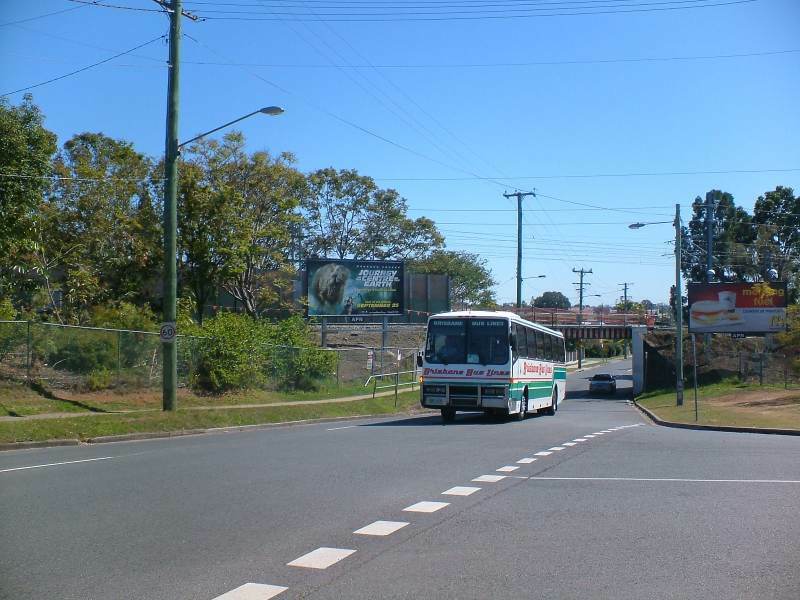 This is on the corner into Corinda from Tennyson. 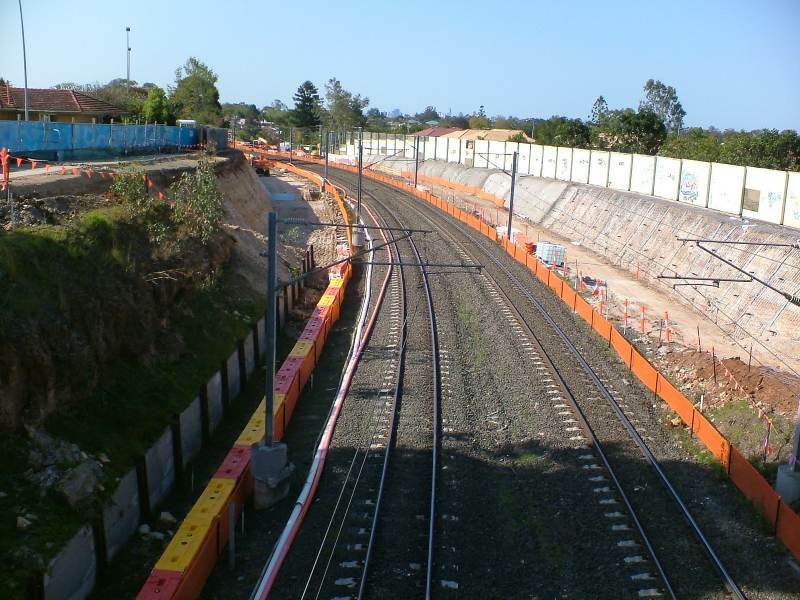 The 4.09 pm Redbank service from Central departing from Corinda. 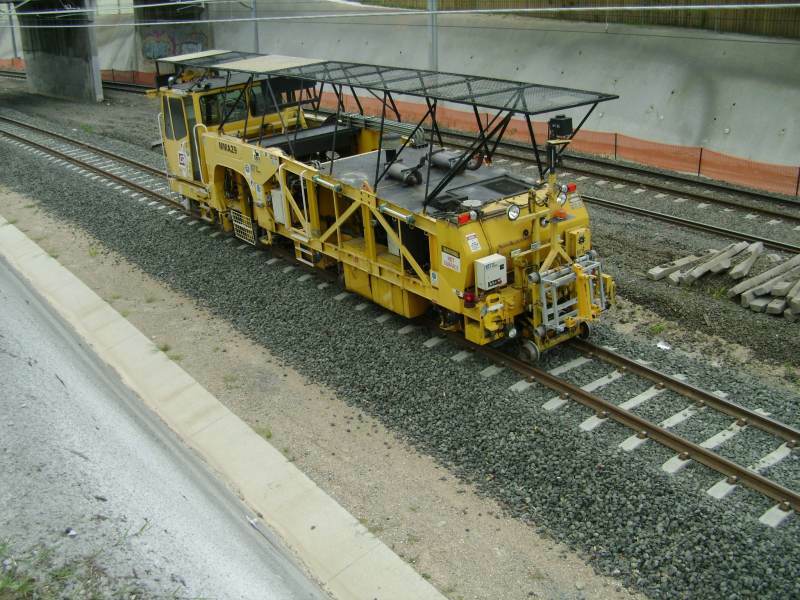 IMU173 leading. 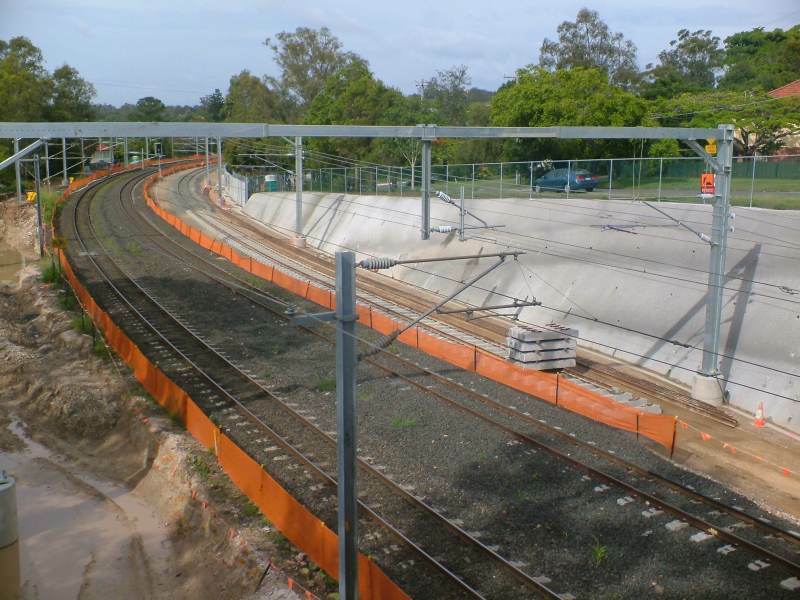 Looking towards Corinda from the Cliveden Avenue road bridge. 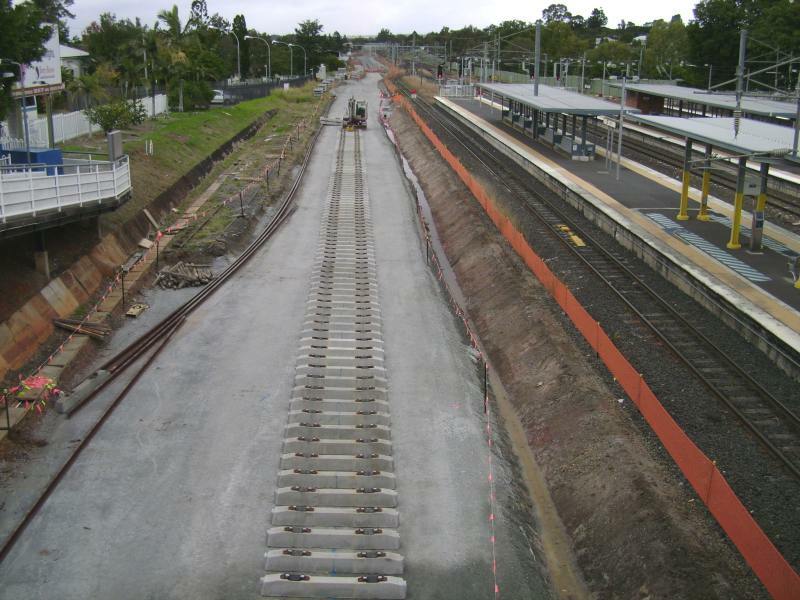 Track closure 8pm Friday 17 first trains 20 Oct Sherwood to Ipswich. 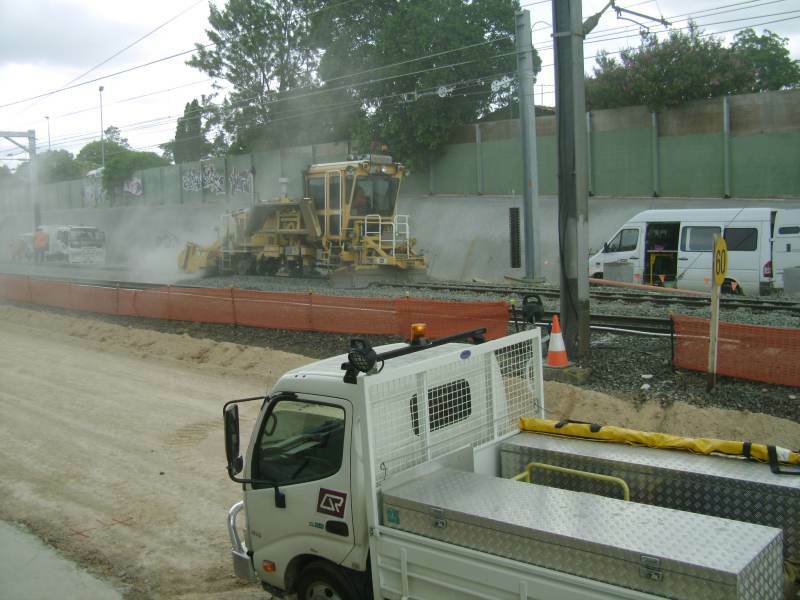 Work going on all over. 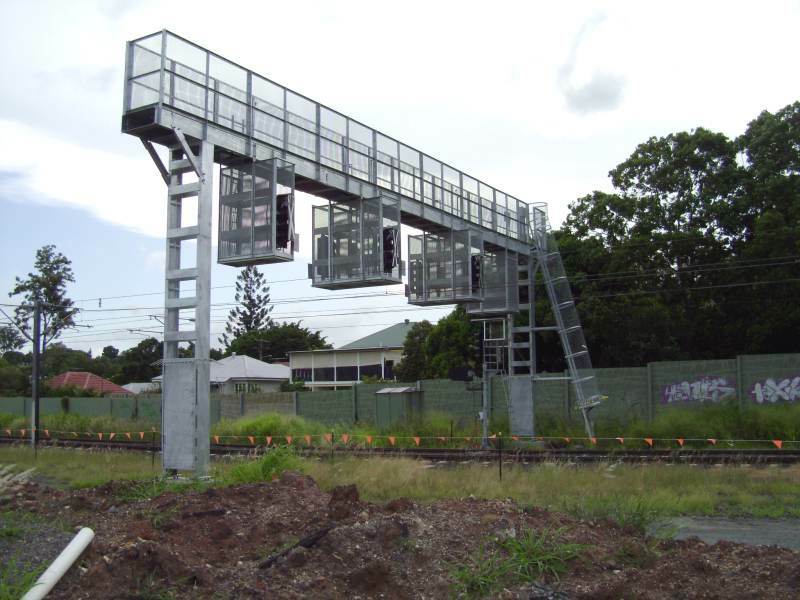 Corinda new signal gantry in place. 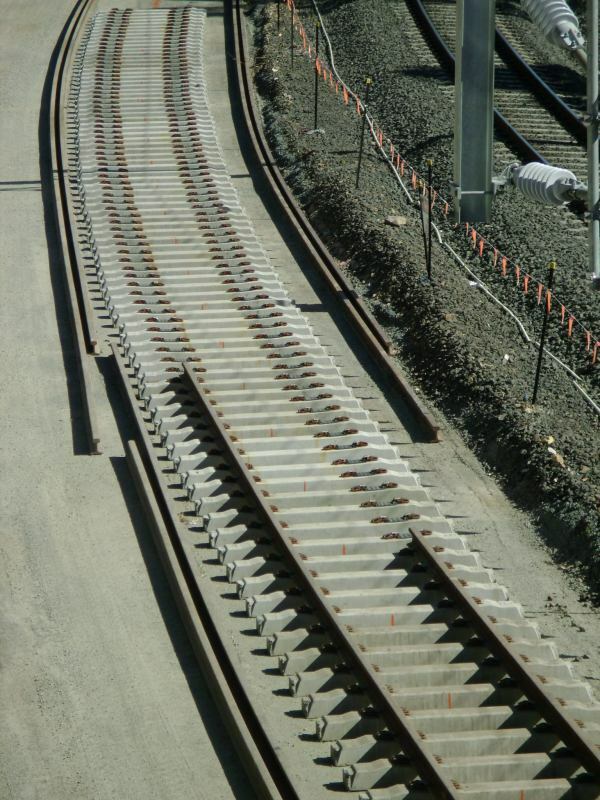 Many thanks to Trackstar for use of these photographs. 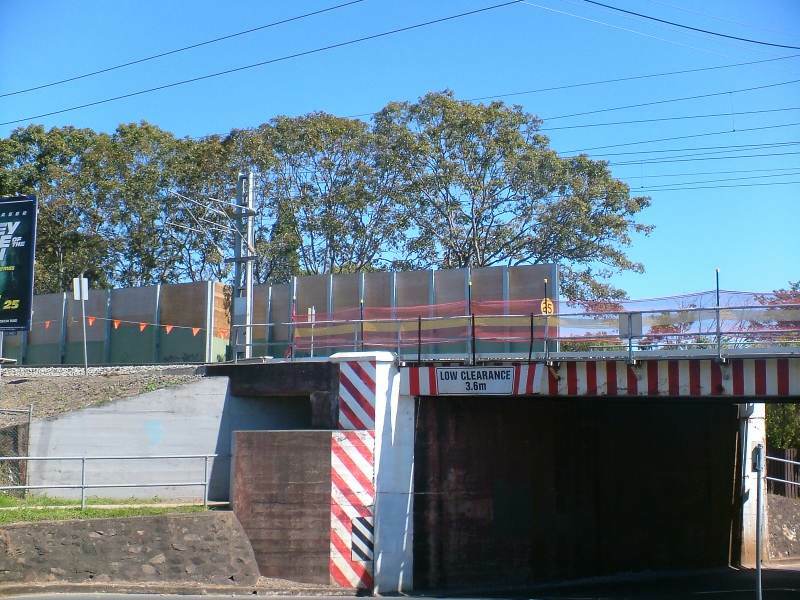 Some updates around the Cliveden Avenue overbridge. 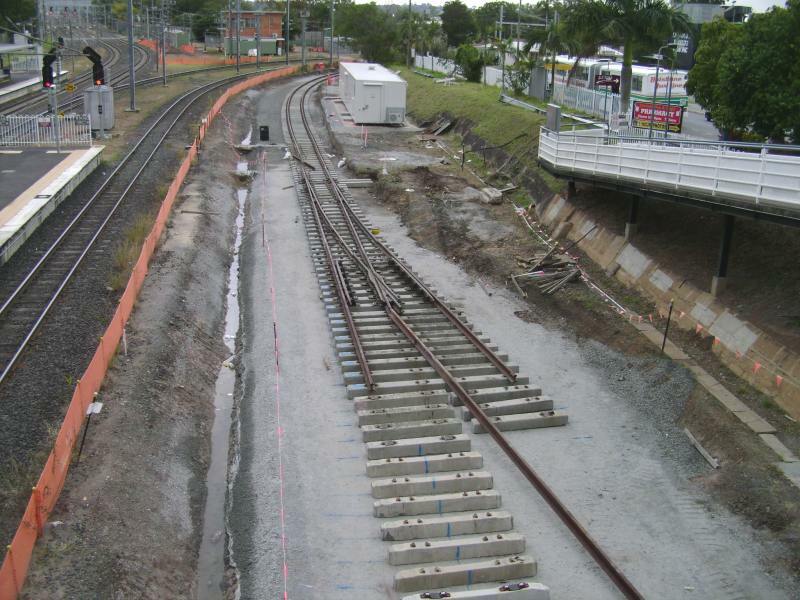 The bridge is now ready for the 4 tracks. 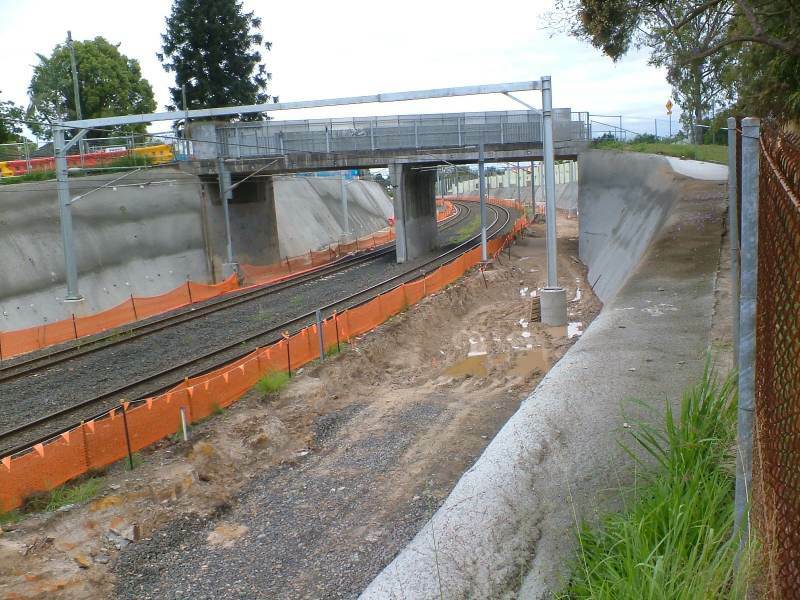 Some more updates from the Cliveden Avenue overbridge. 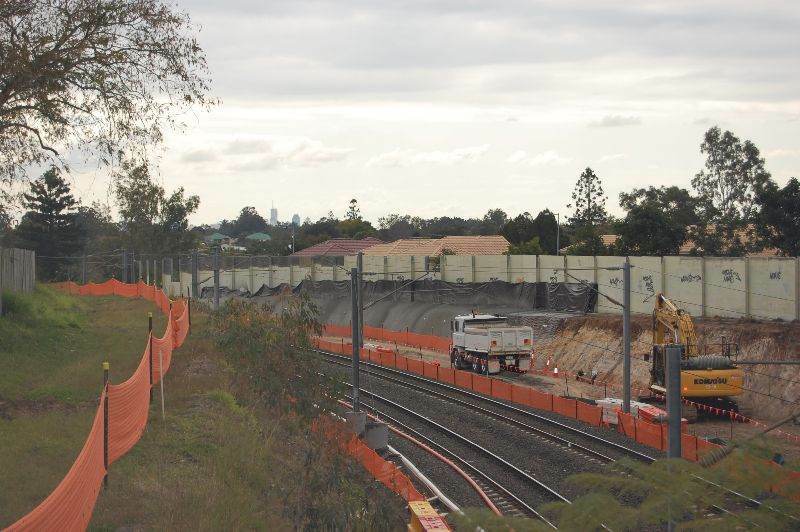 New down line has almost reached the bridge from Oxley. 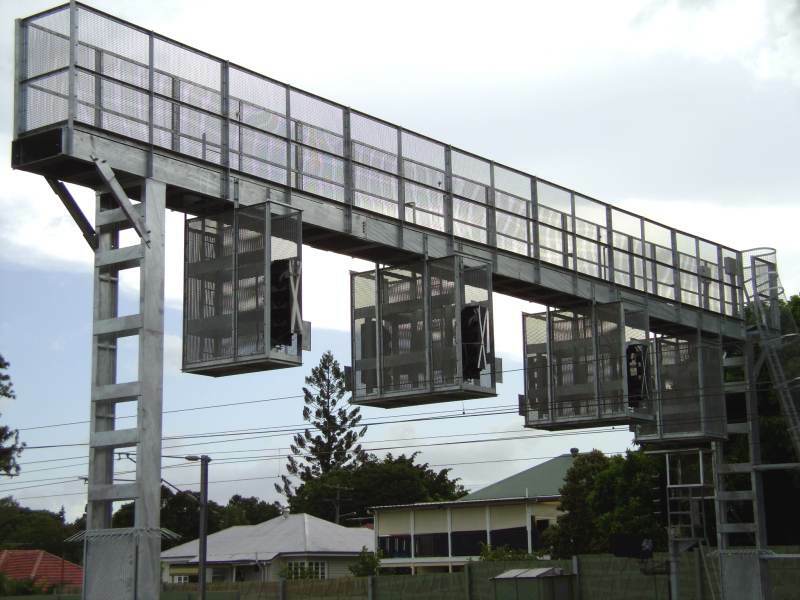 The new signal gantry between Corinda and Oxley. 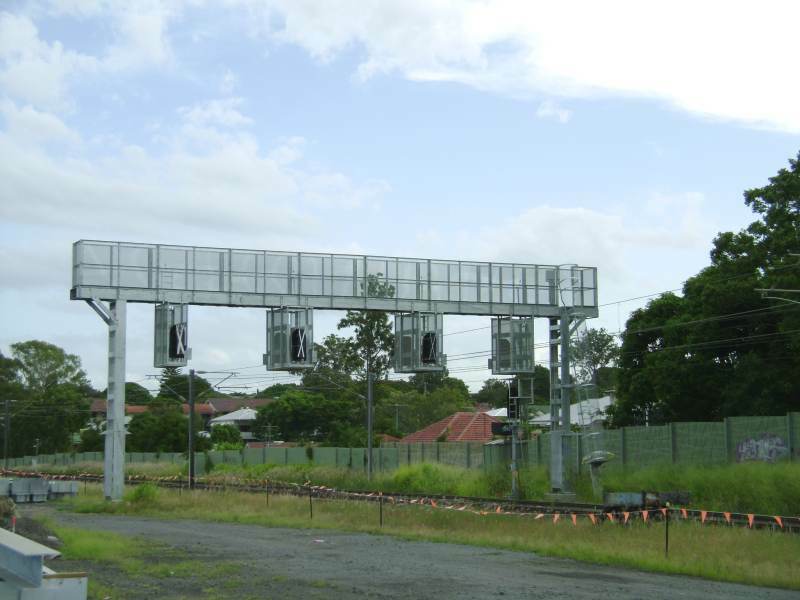 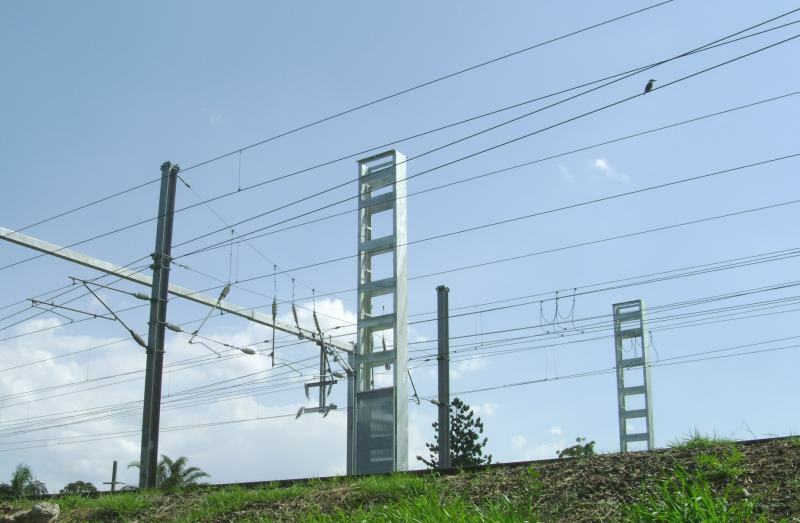 I have been wondering when the new signal gantry between Sherwood and Graceville will be put up. 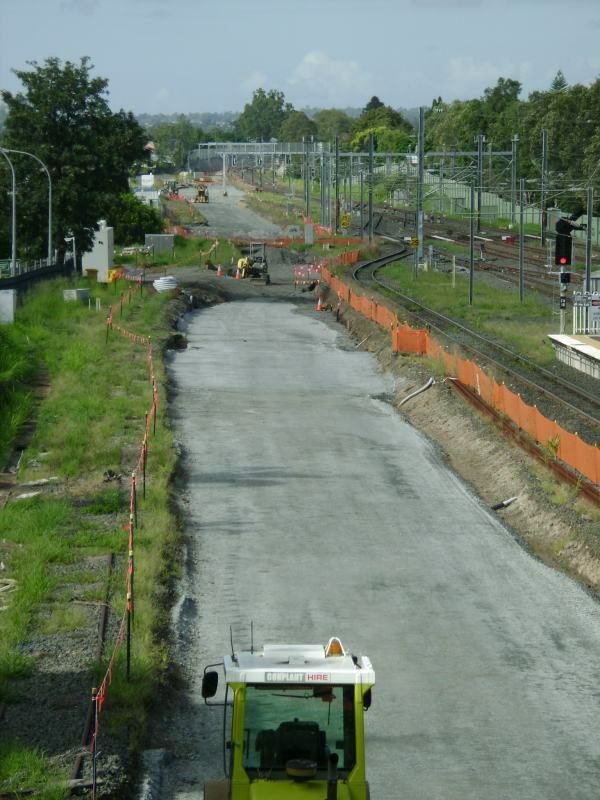 Looks strange laying on the ground for the last few weeks. 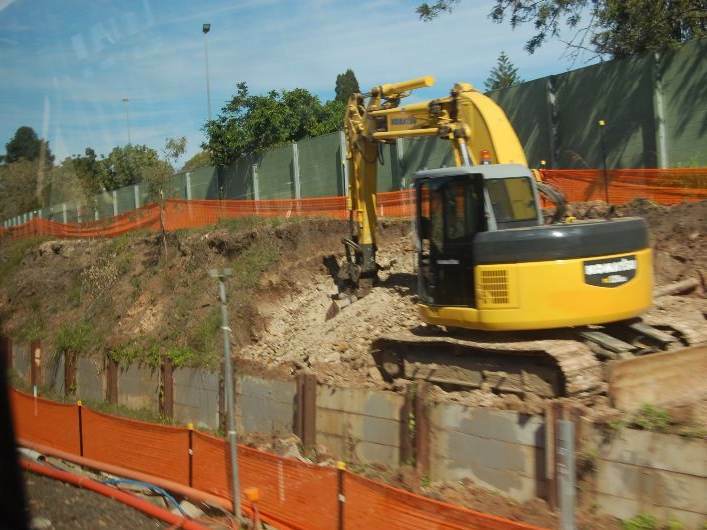 The former down is gone! 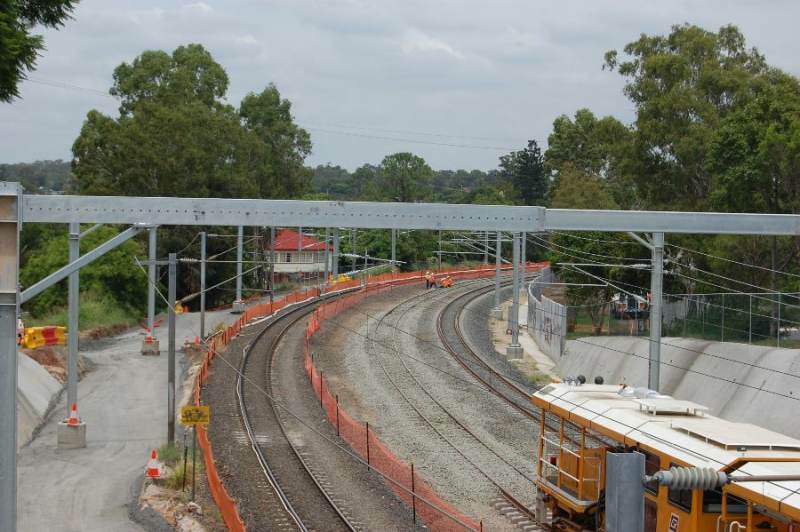 Some shots around the Cliveden Avenue road overbridge. 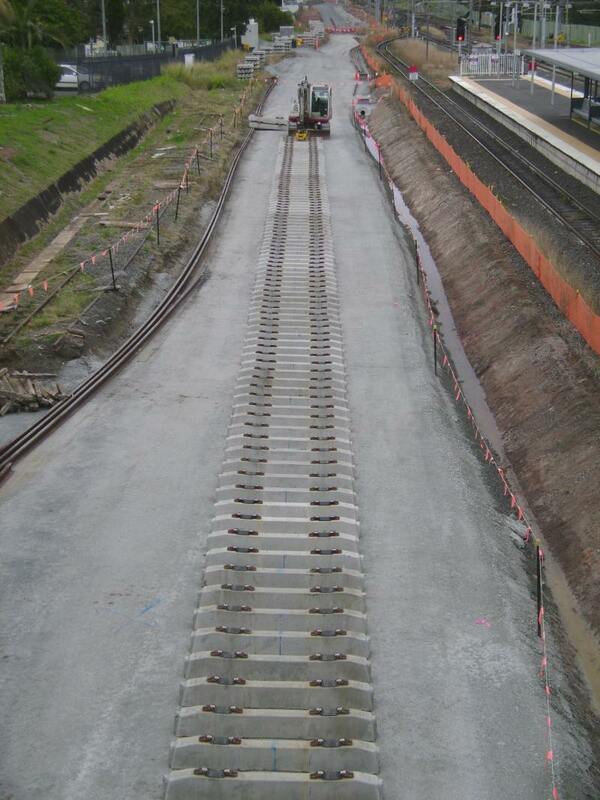 Ballasting and track alignment done. 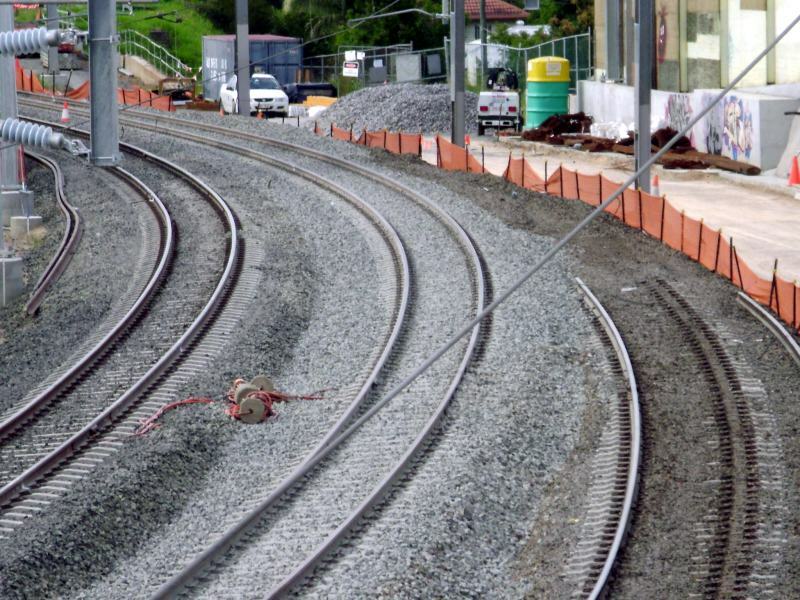 Wiring to be completed. 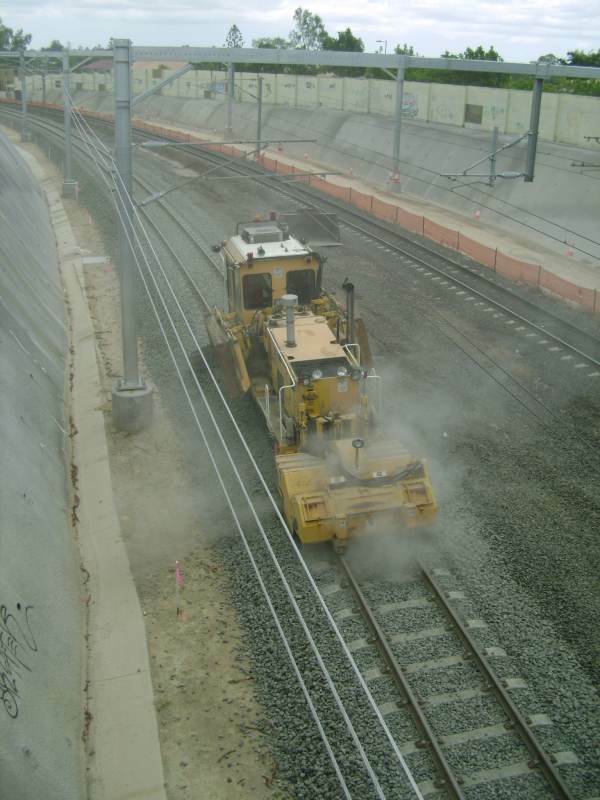 Preparing the track for the slew at the end of February. 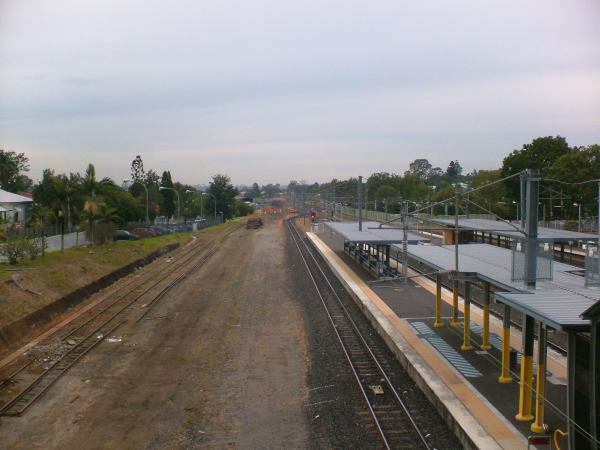 Platform 2 will be back in operation at Oxley for up trains. 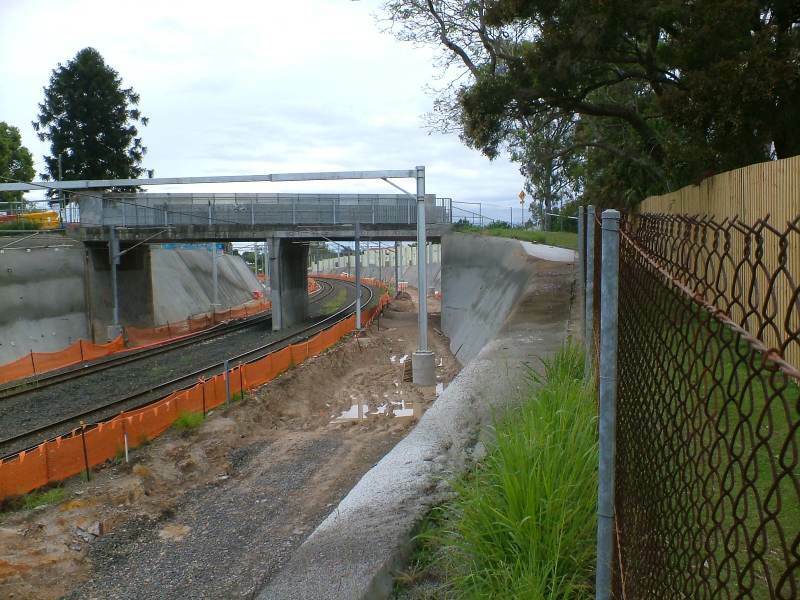 Around the Cliveden Avenue road bridge, between Oxley and Corinda. 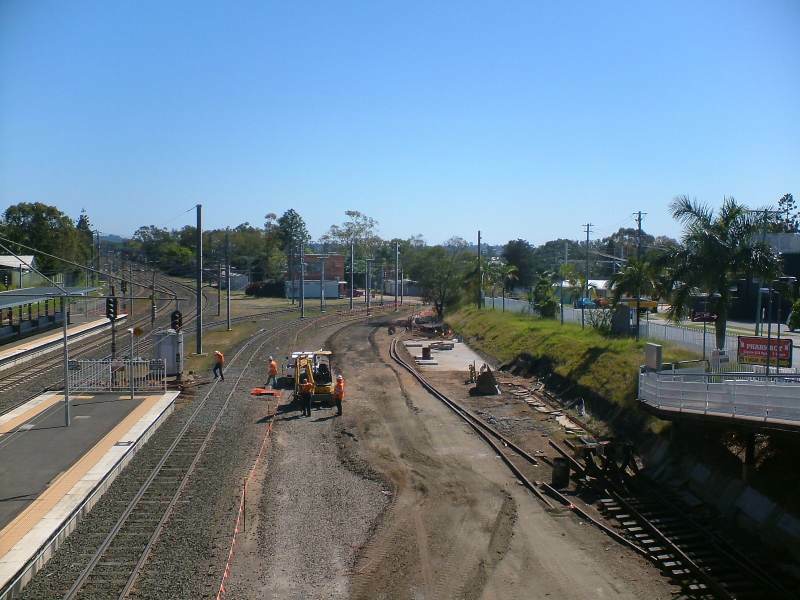 Work is proceeding at Corinda for the freight line. 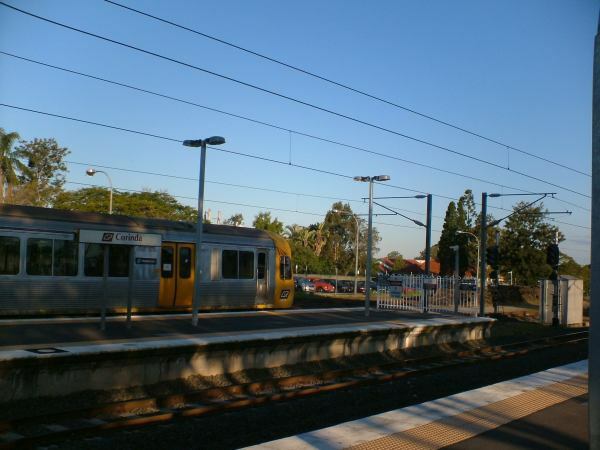 Busy early morning at Corinda. 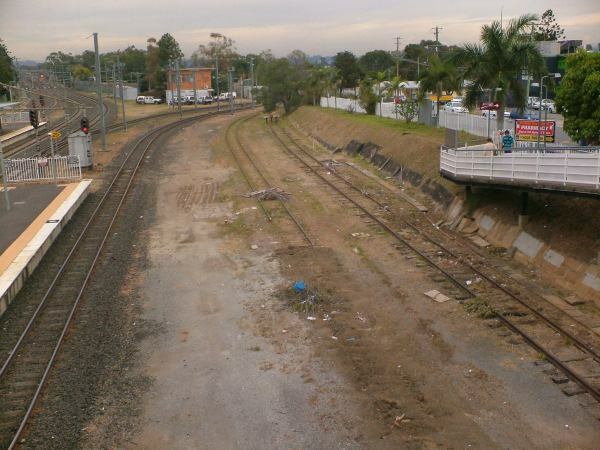 Looking in a down direction from platform 5 Corinda. 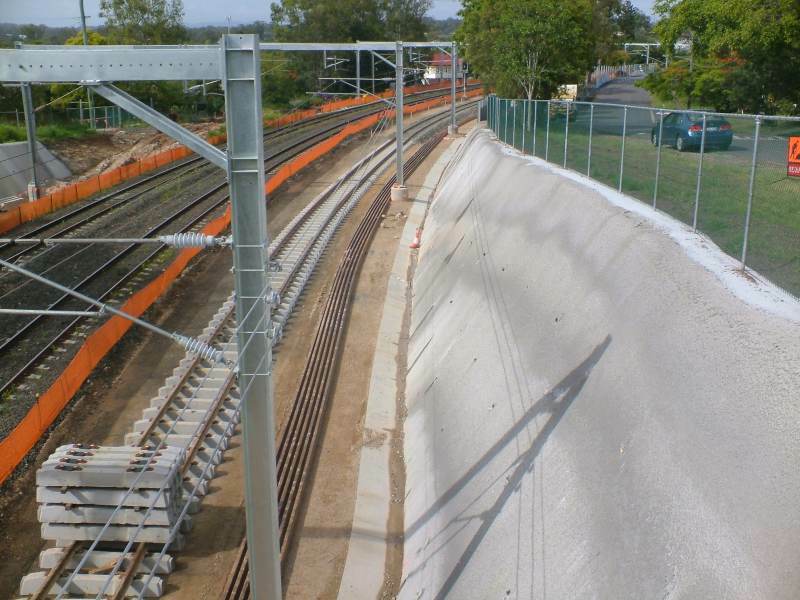 Looking towards Corinda from the Cliveden Avenue bridge. 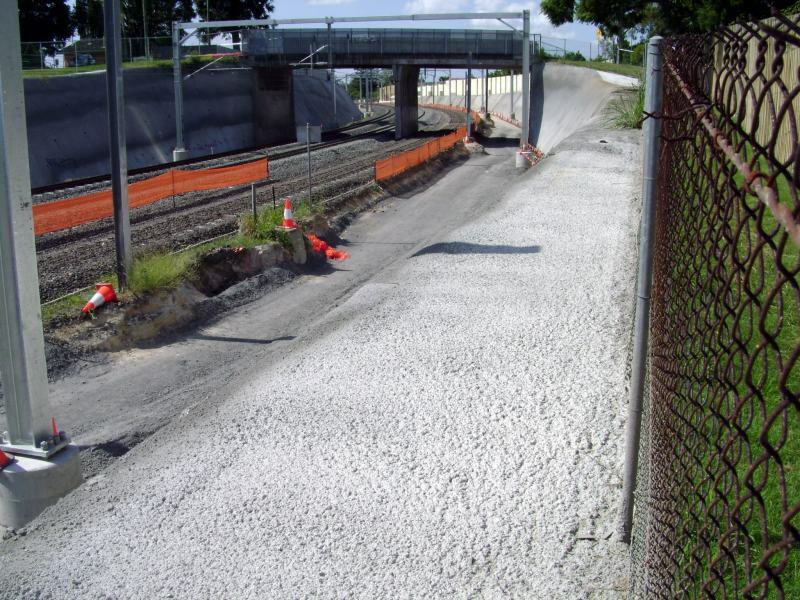 Track is ready for the slew this coming weekend. 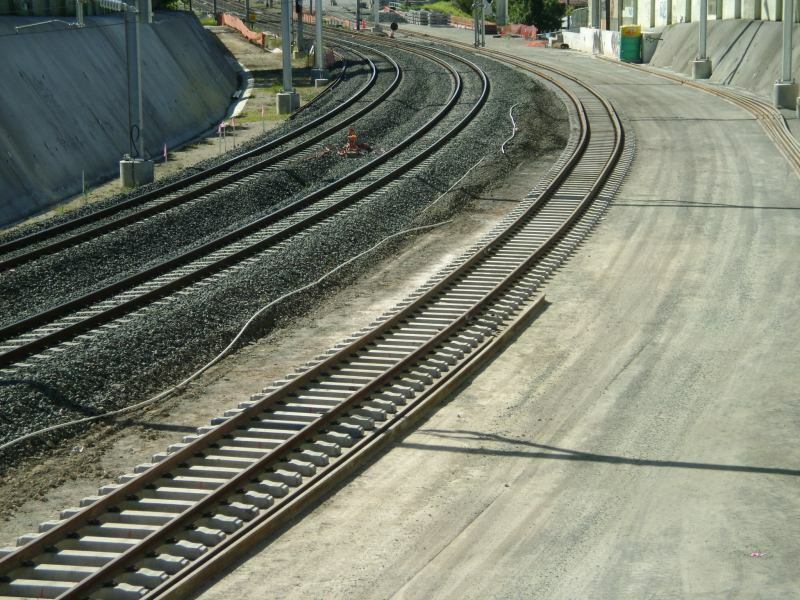 Track is ready for the resumption of services. 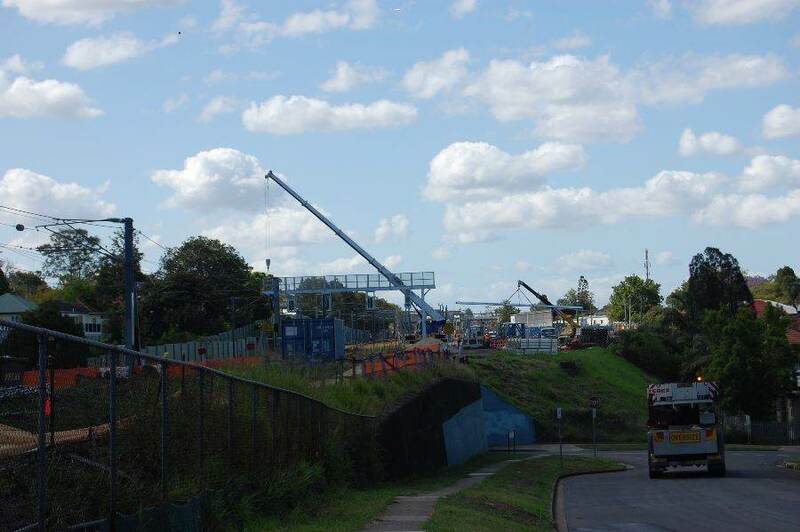 Update from Cliveden Avenue road bridge. 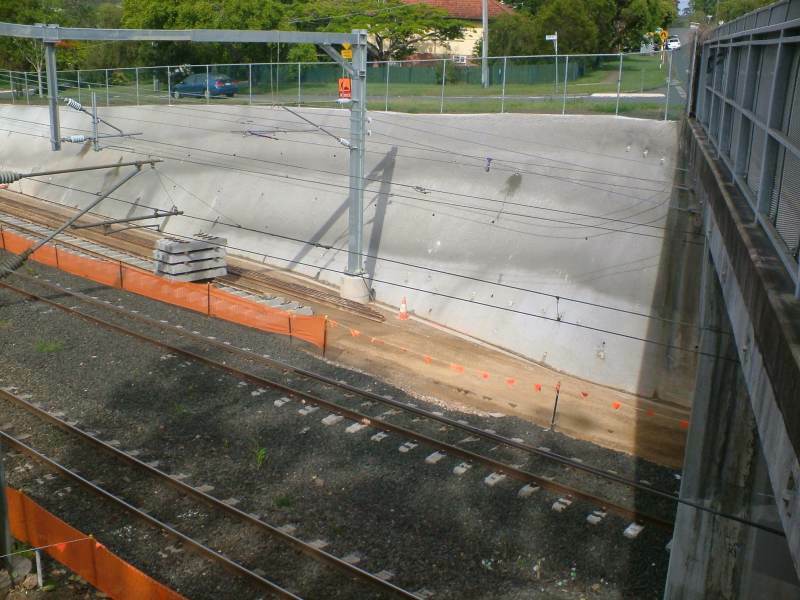 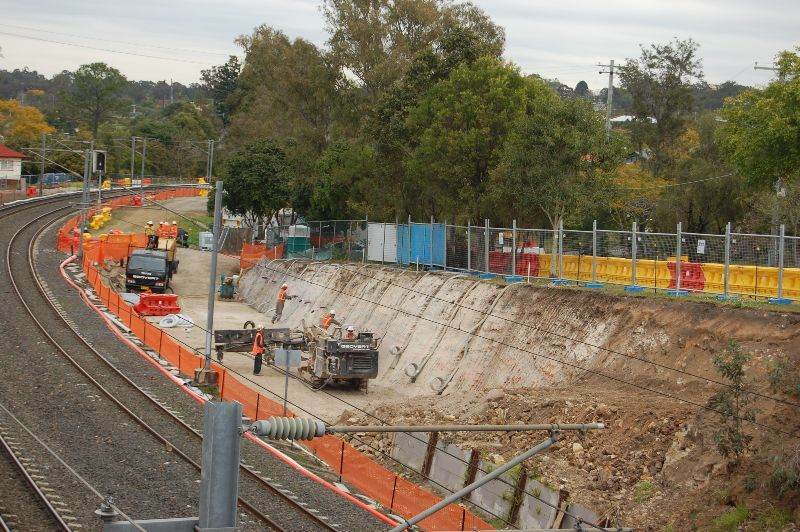 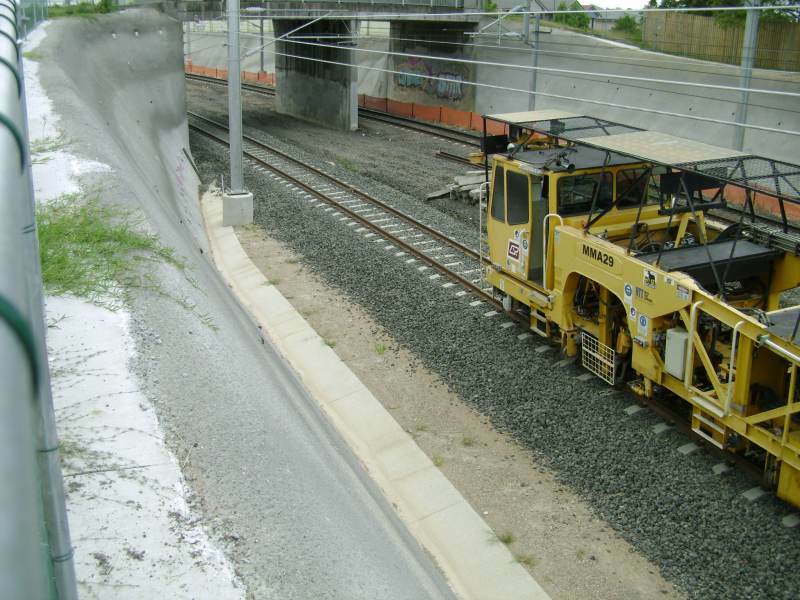 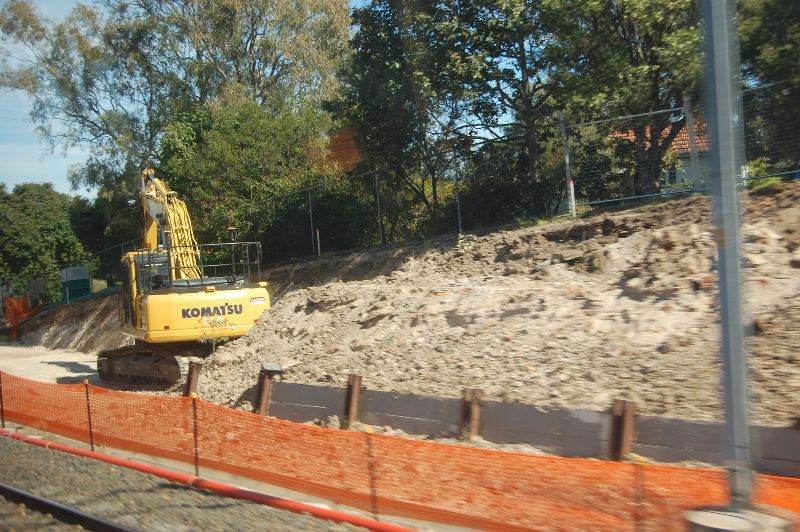 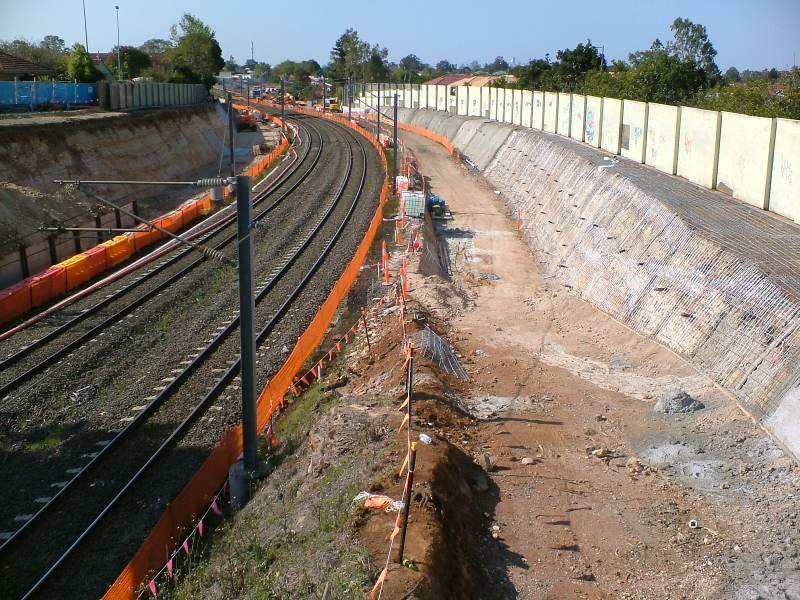 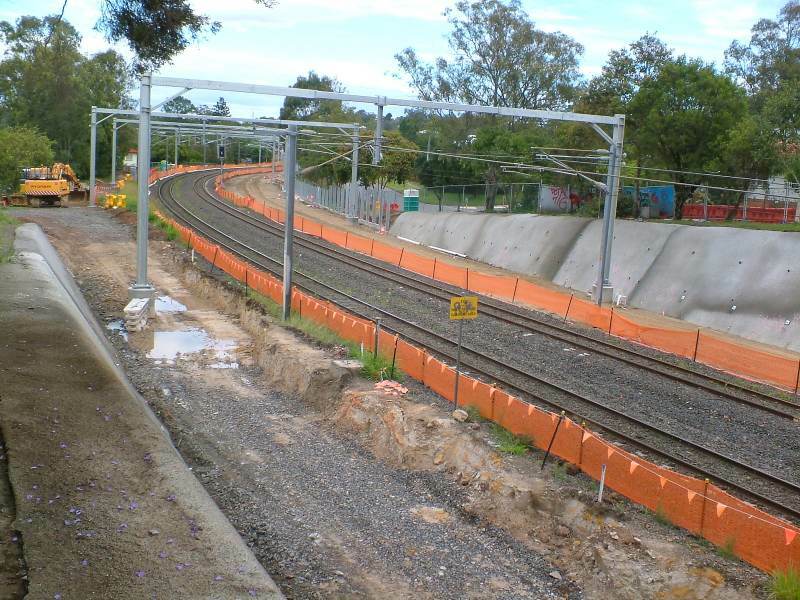 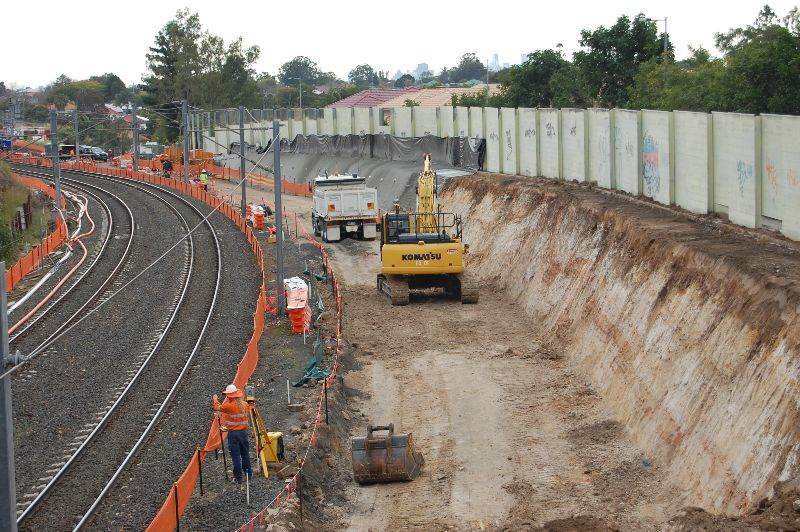 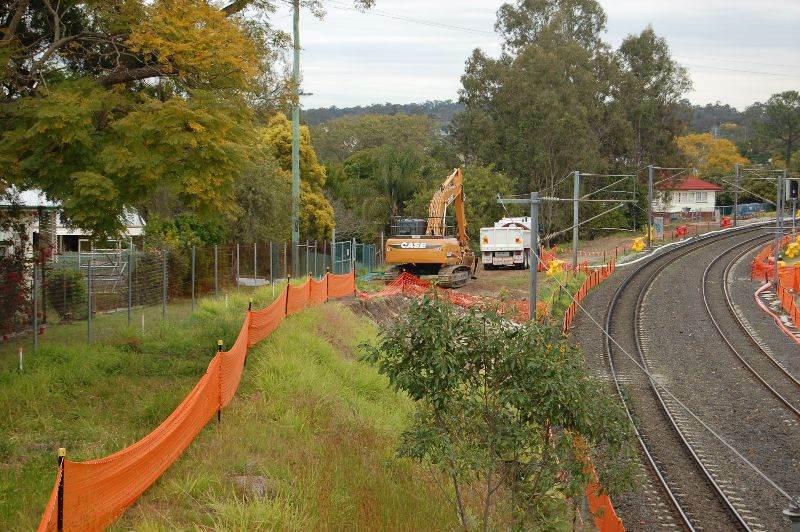 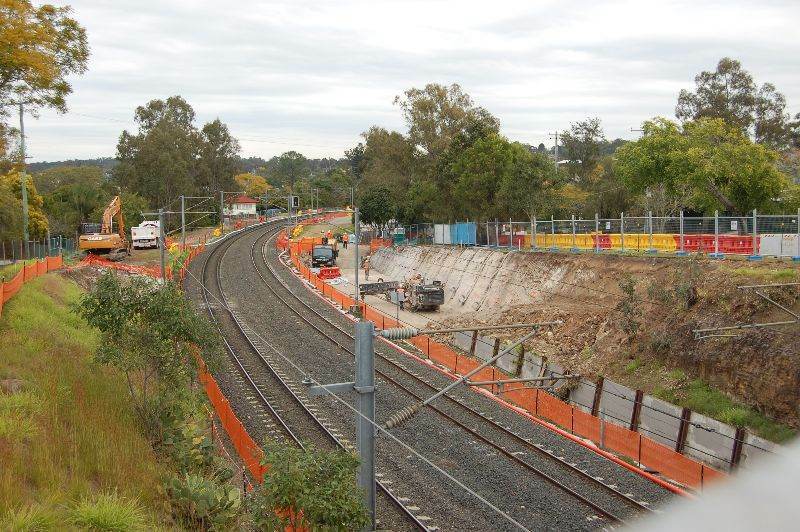 Work proceeding with OHT between Corinda and Sherwood. 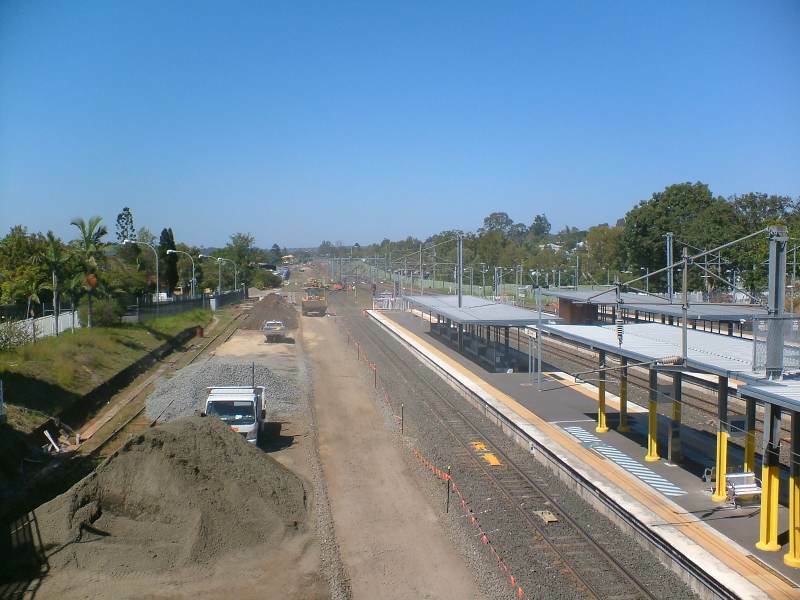 Looking towards Oxley from Corinda station. 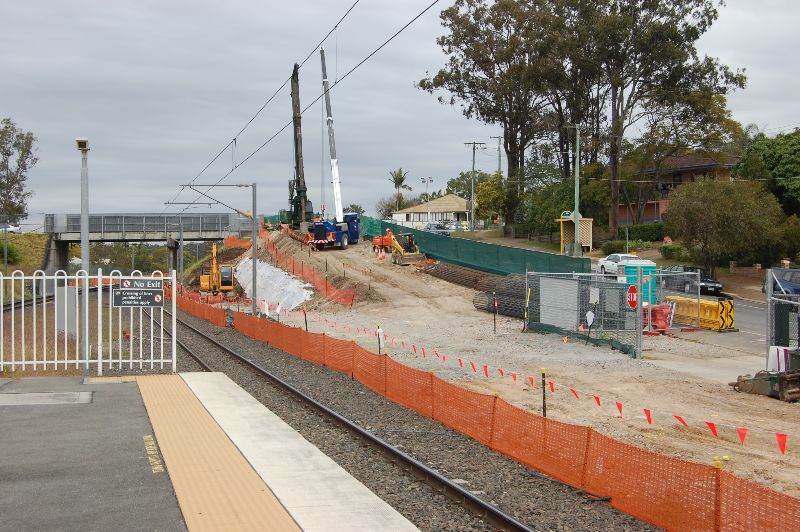 It is all happening at Corinda. 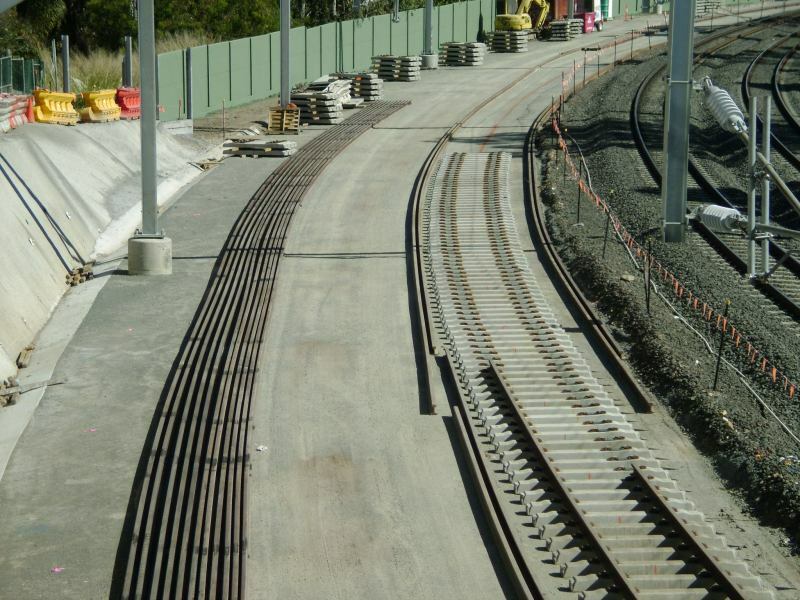 The freight line has started to be laid. 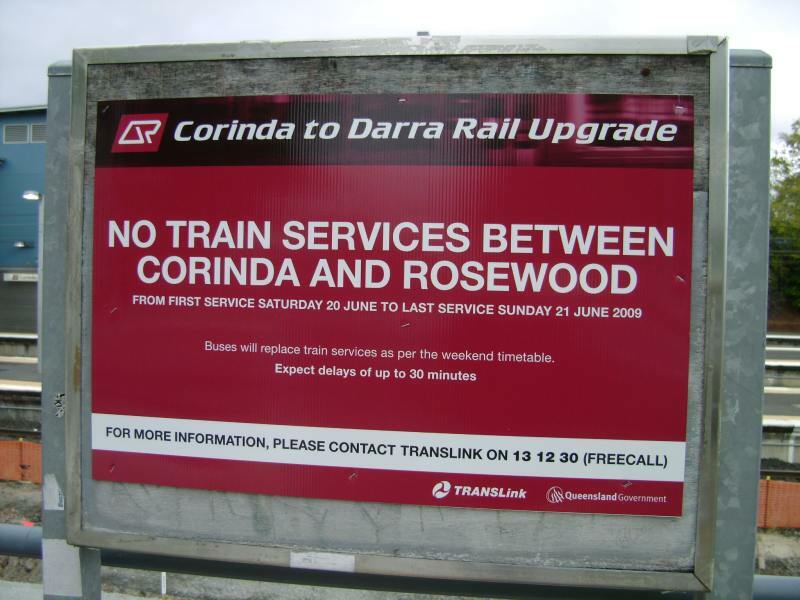 Another track closure between Corinda and Rosewood 25 - 26 July 2009. 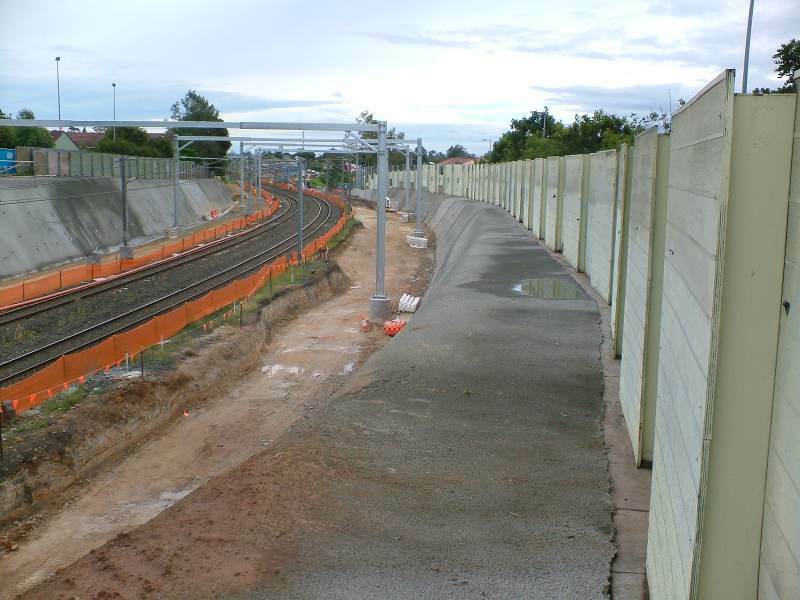 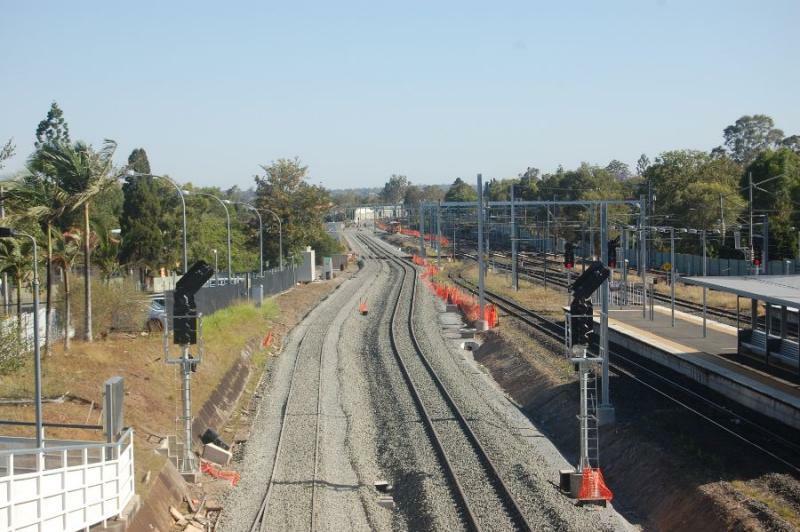 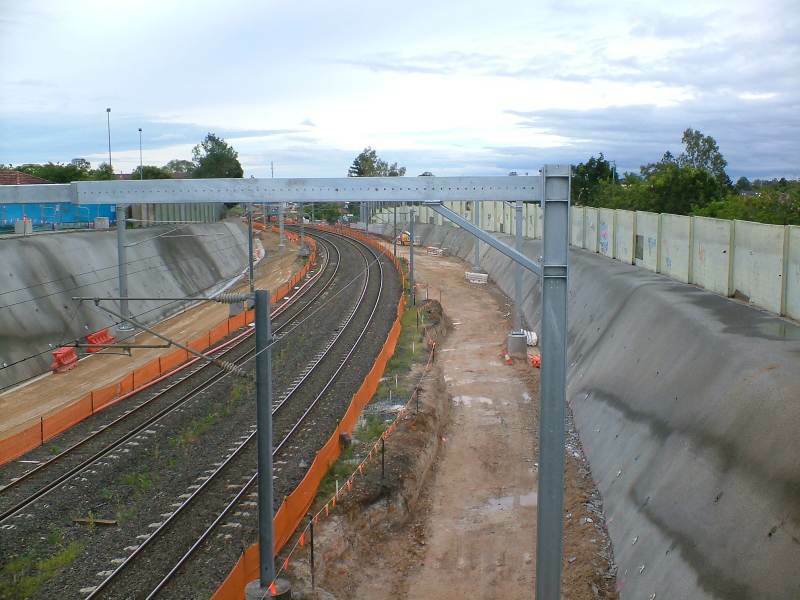 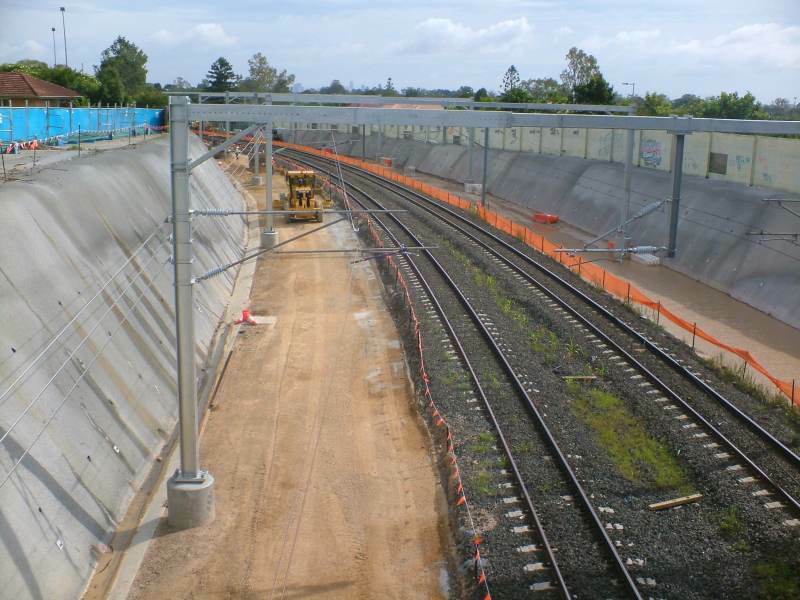 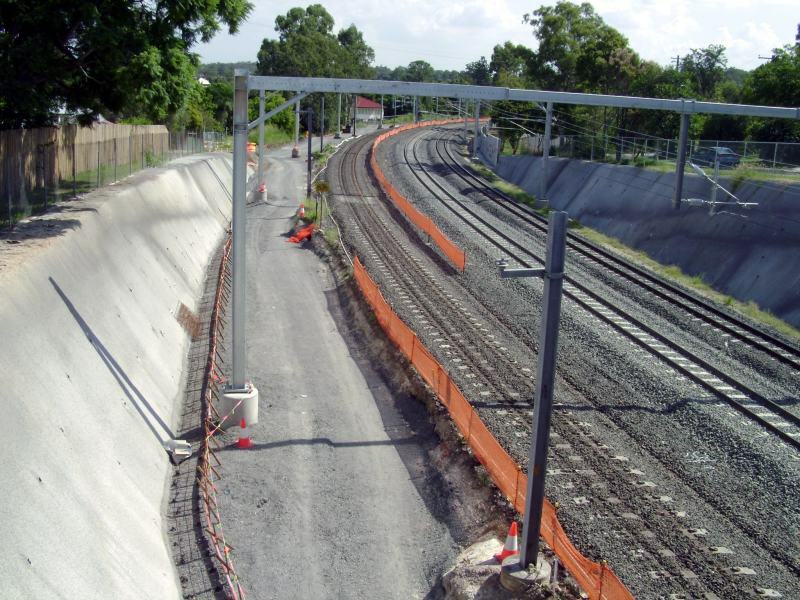 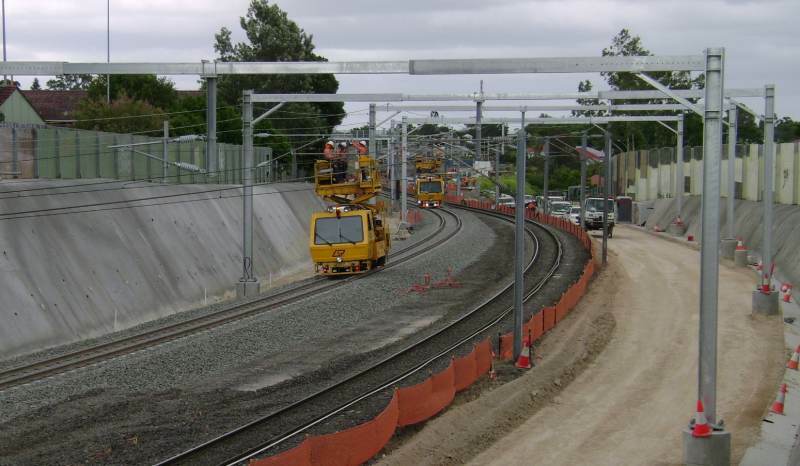 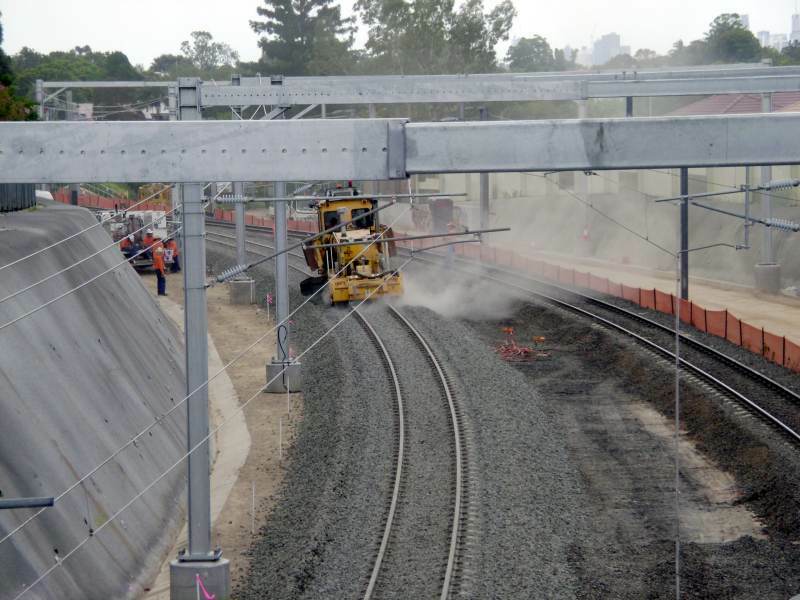 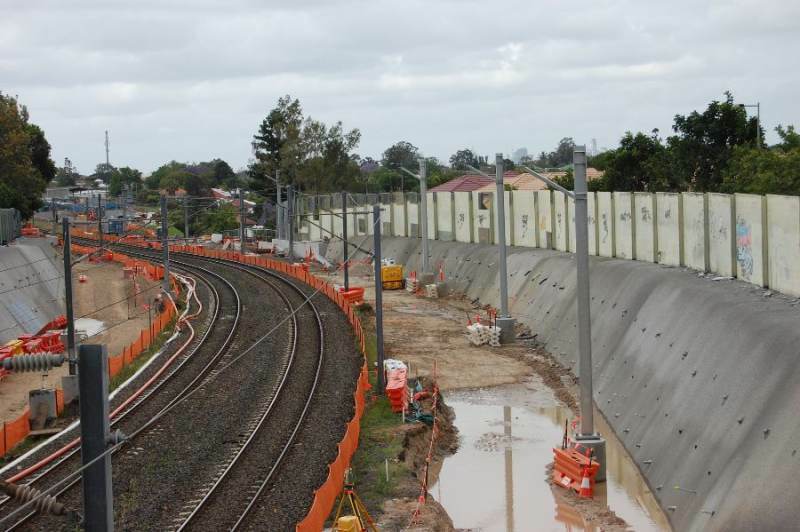 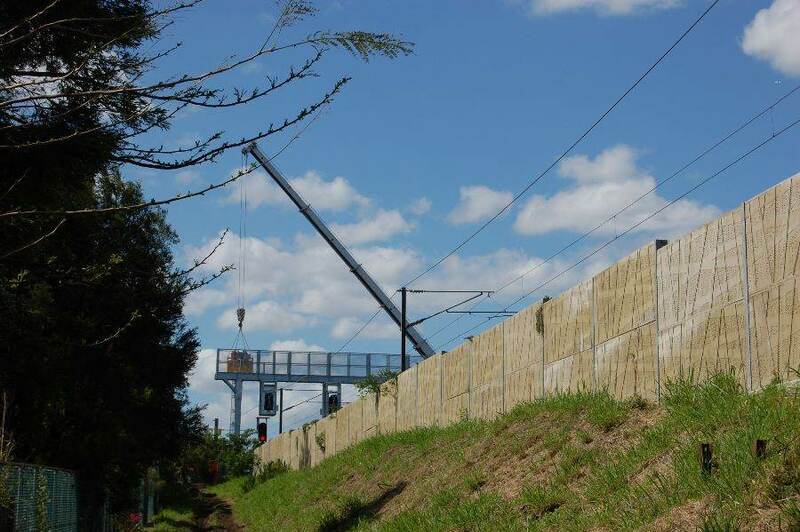 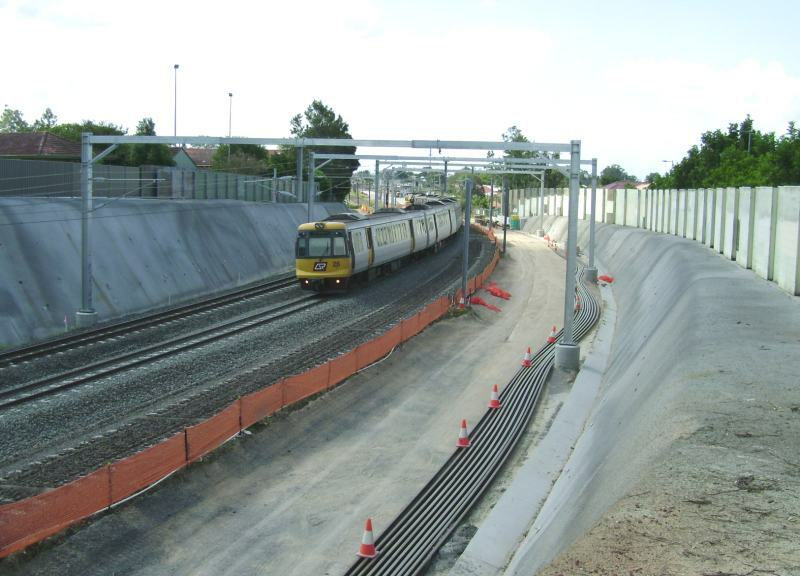 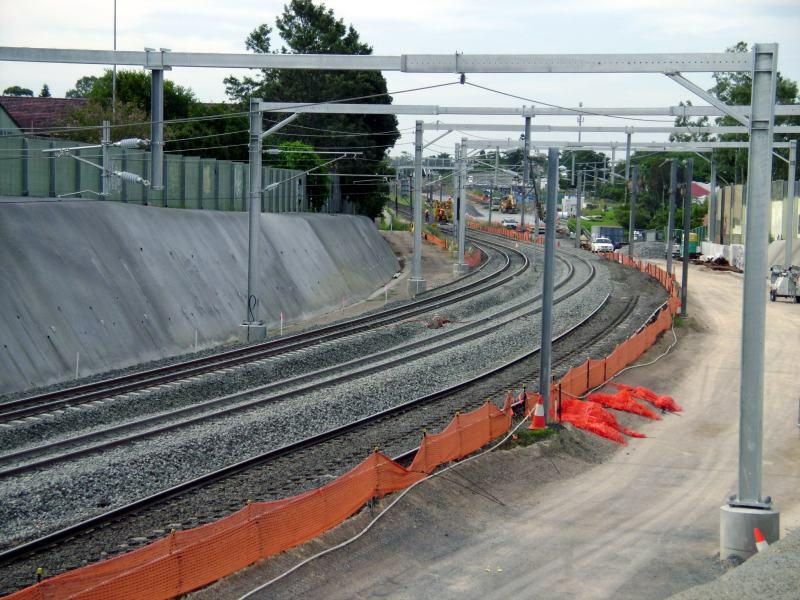 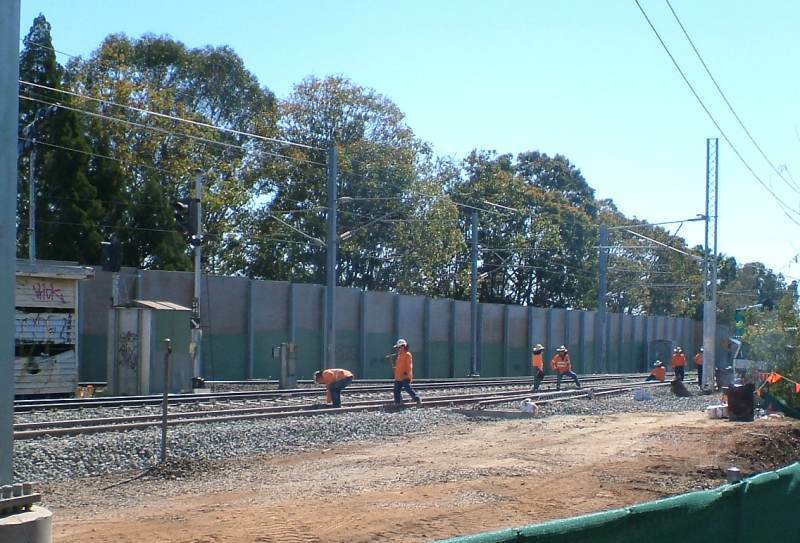 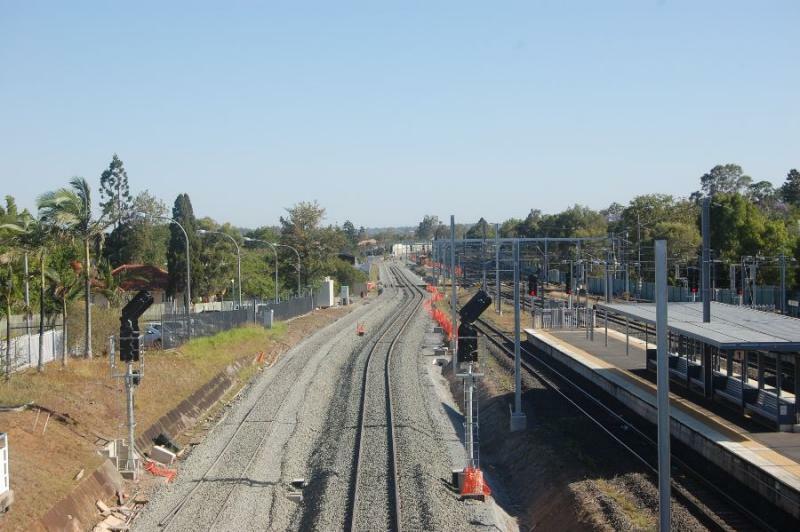 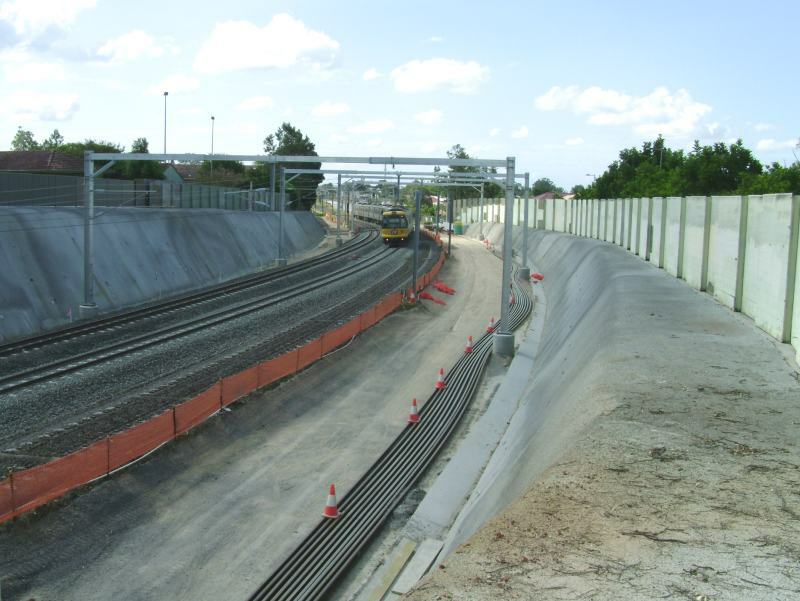 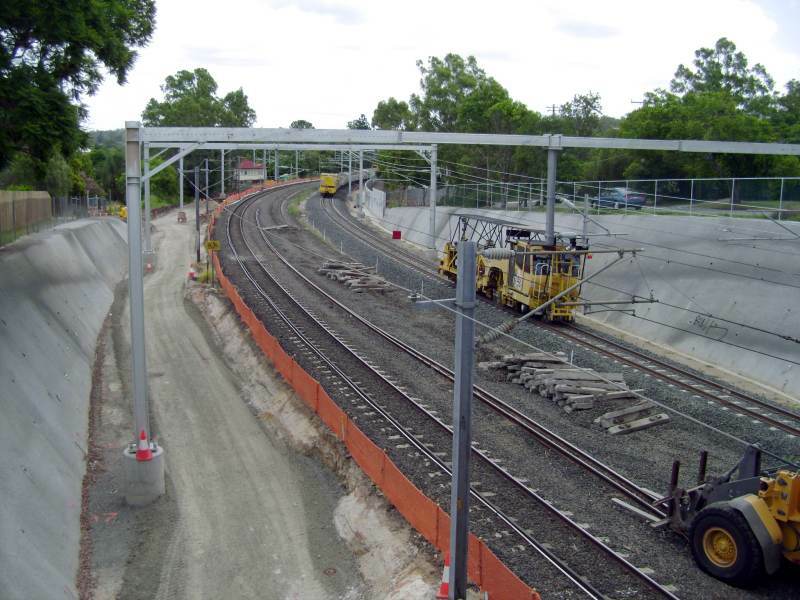 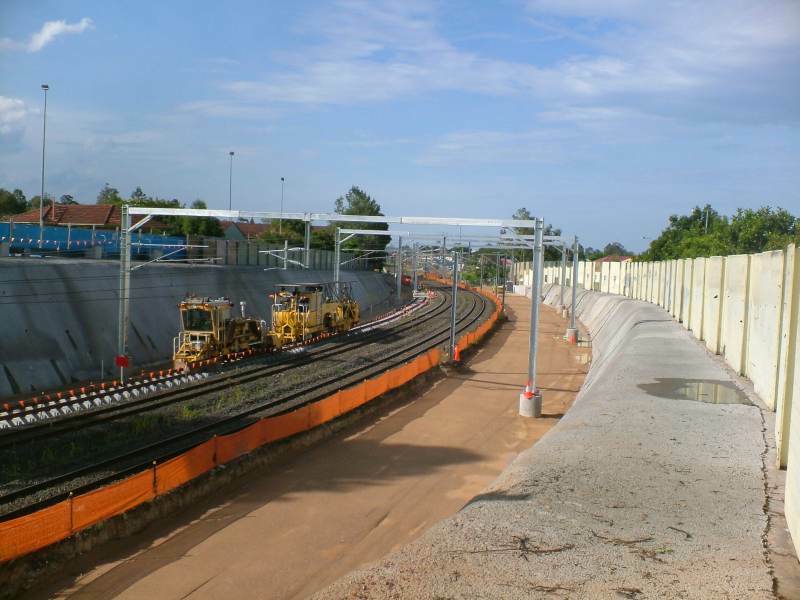 The freight line is taking shape at Corinda. 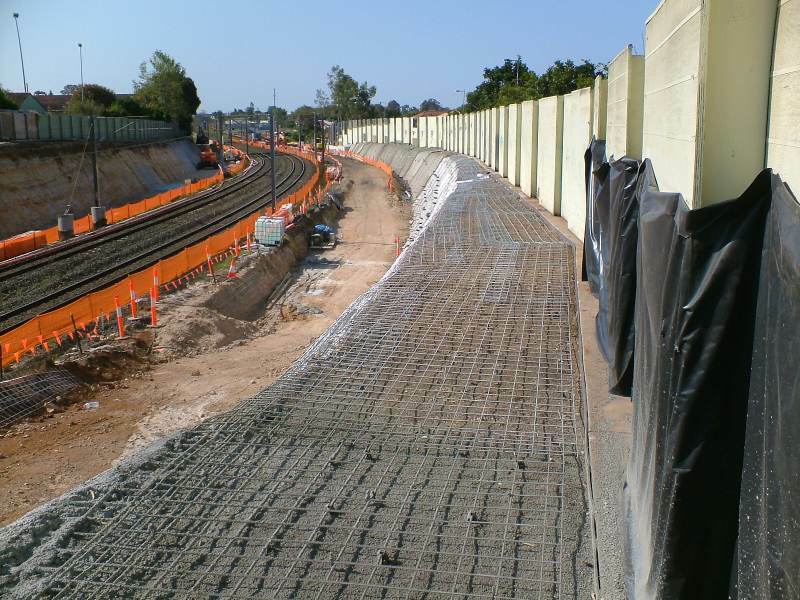 View down and up from Cliveden Avenue road overbridge. 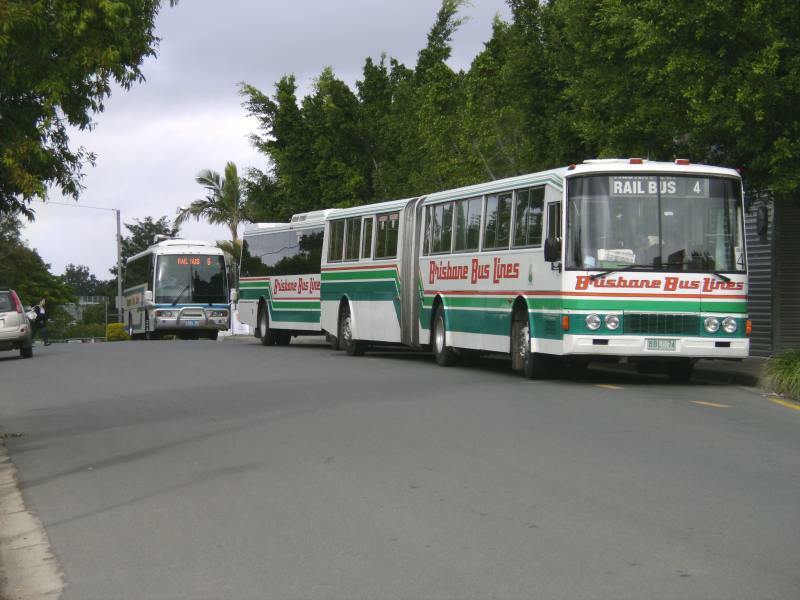 The new line is the suburban. 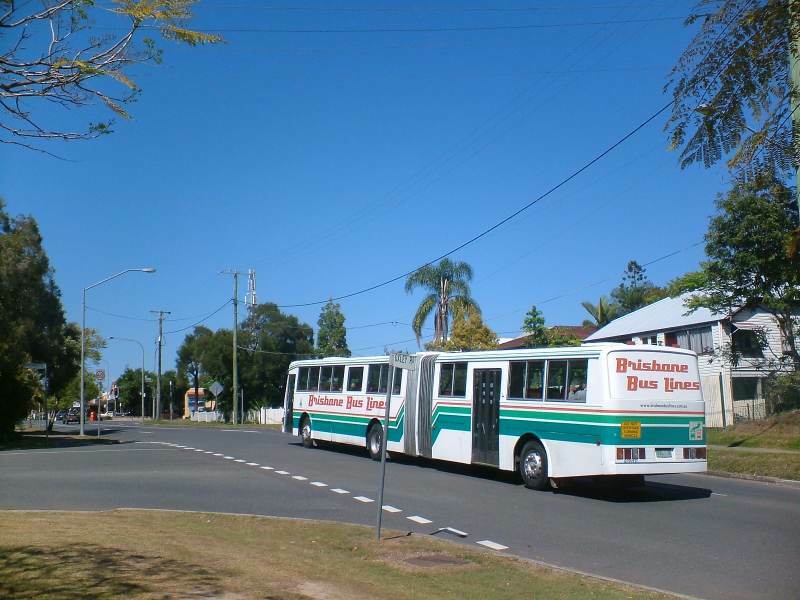 I thought it was just going to be a conventional quad Corinda-Darra. 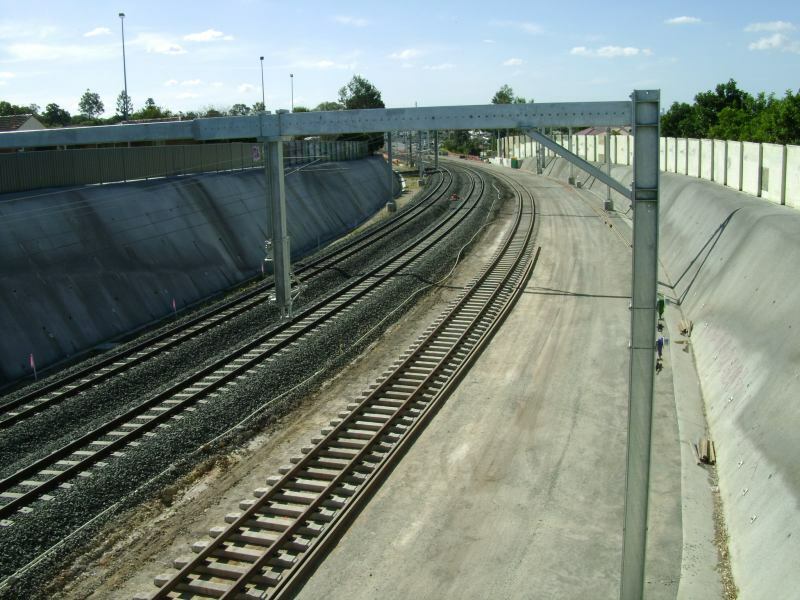 What's the talk of a freight track? 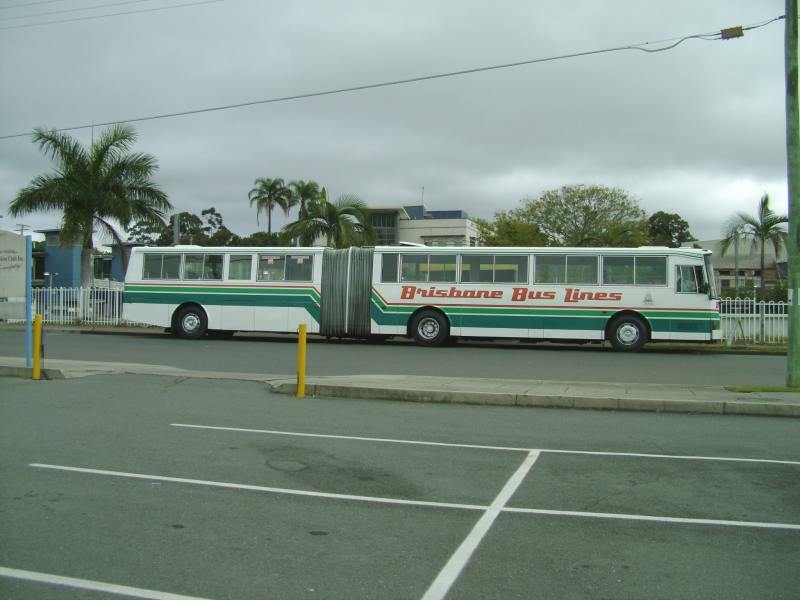 Originally double to triple. 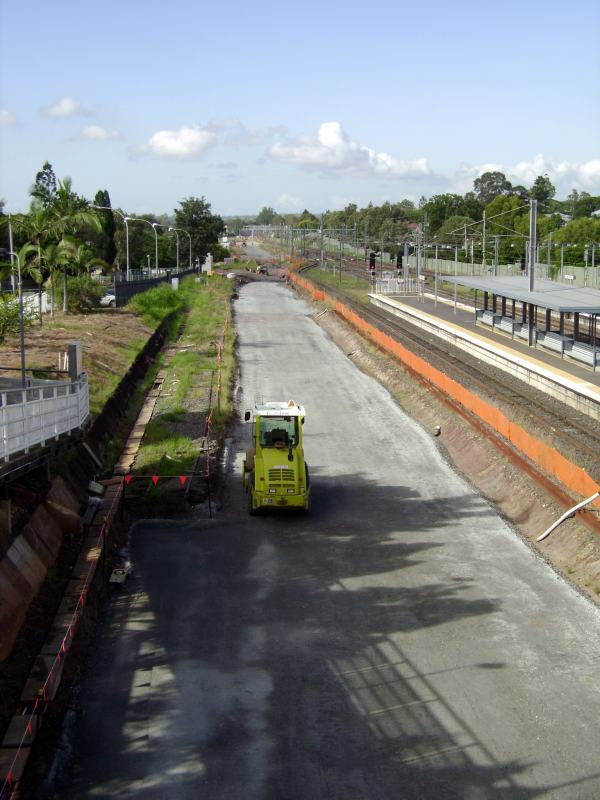 Shortly after the project commenced it was upgraded to a quad. 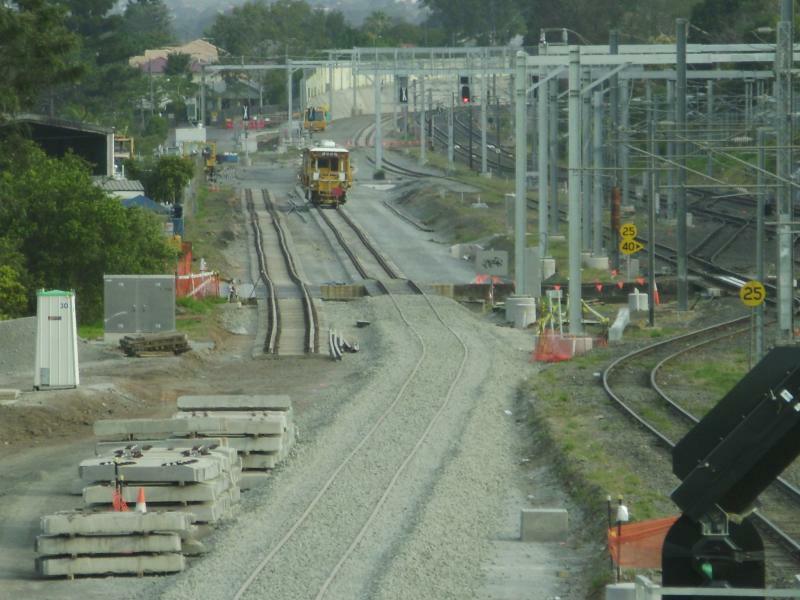 The premise being the additional track was for freight. 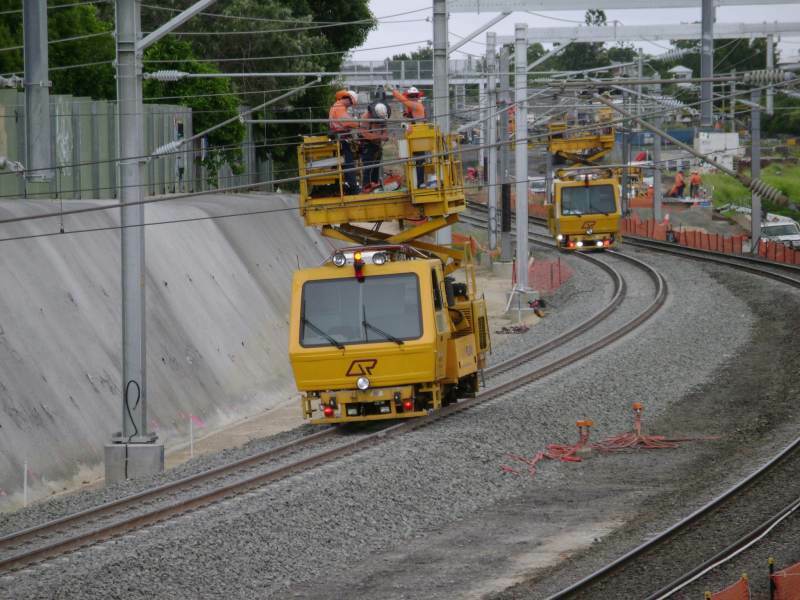 The 4th line will not be electrified at this time although it is planned to be down the track so to speak. 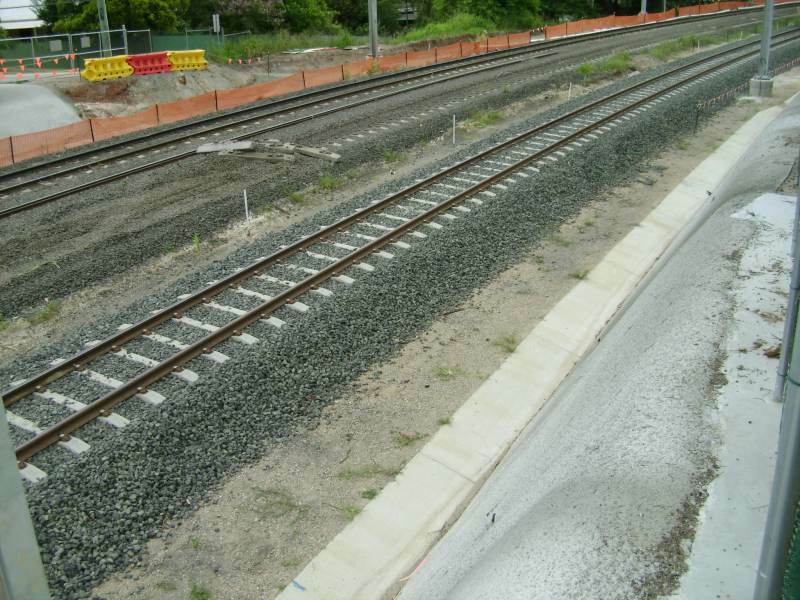 If you look at the photographs immediately above, the two lines left are the freight line and the siding. 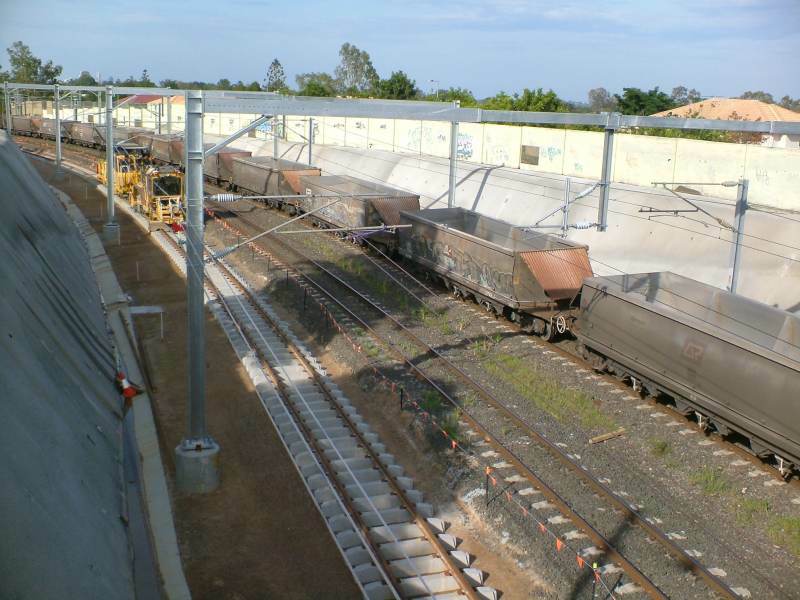 There is capacity to hold two full length freight trains there. 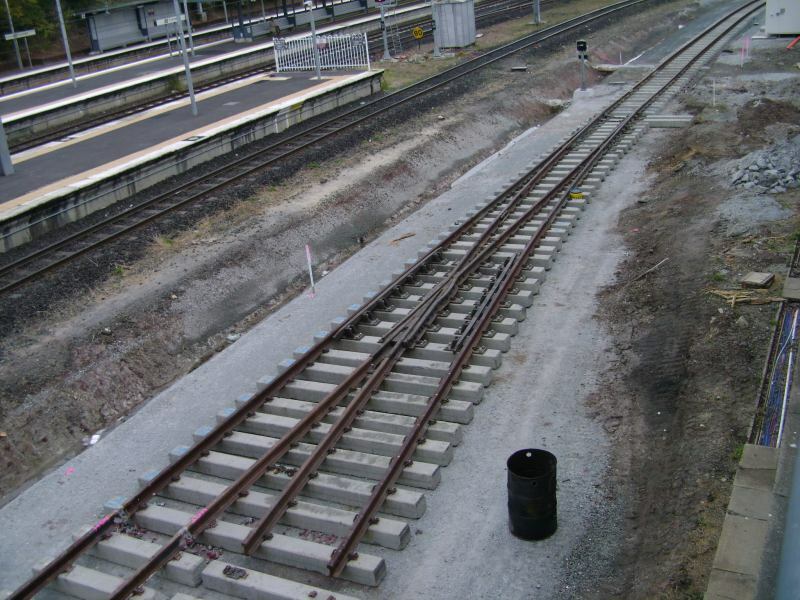 The third sub track is extended from platform 2 road. 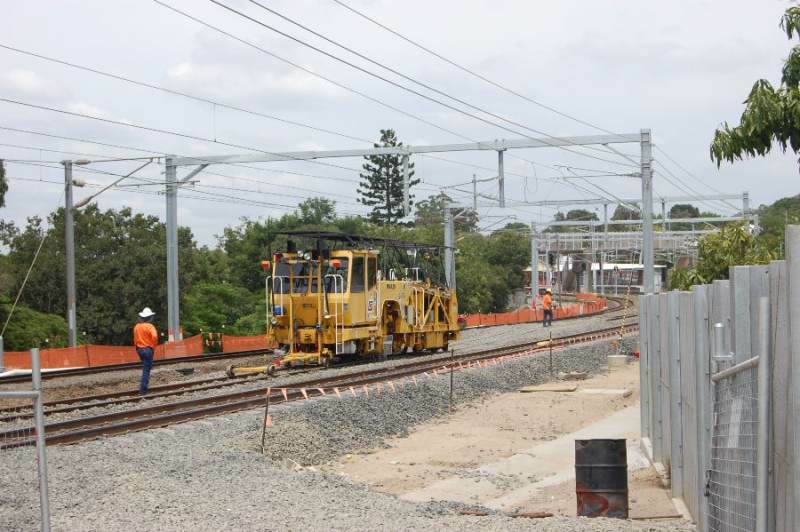 We have endeavoured to get all four lines electrified and the 4th platform at Oxley constructed as part of the present upgrade. 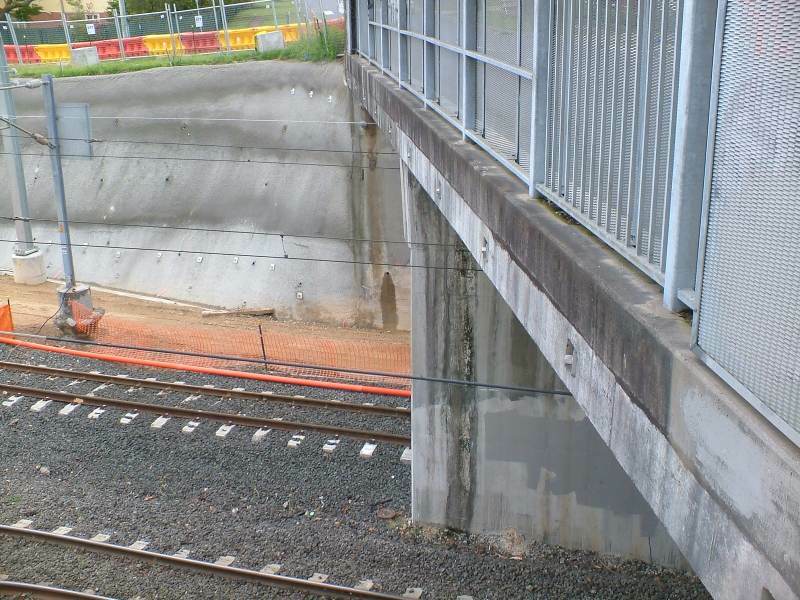 But not successful. 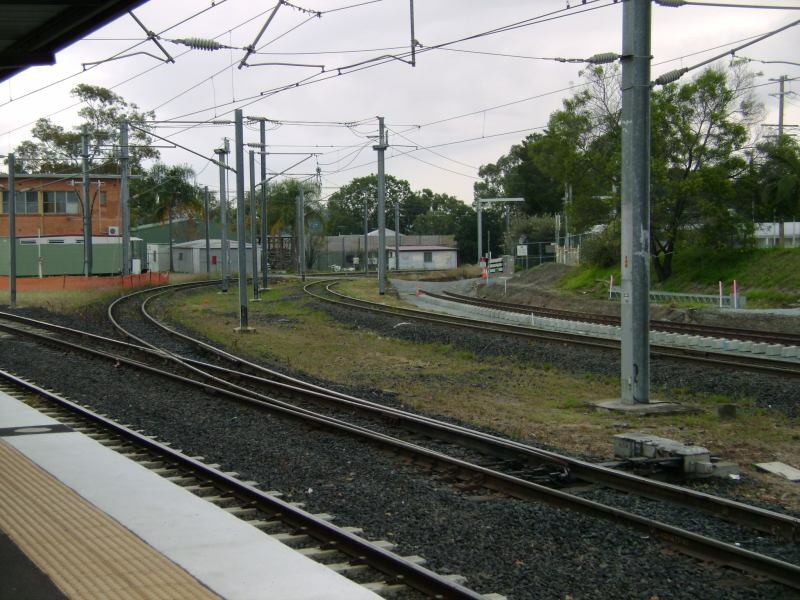 The fourth track will based on the figures from the last rail capacity study which already have been proven to understate the passenger demand be required for passenger services by 2016. 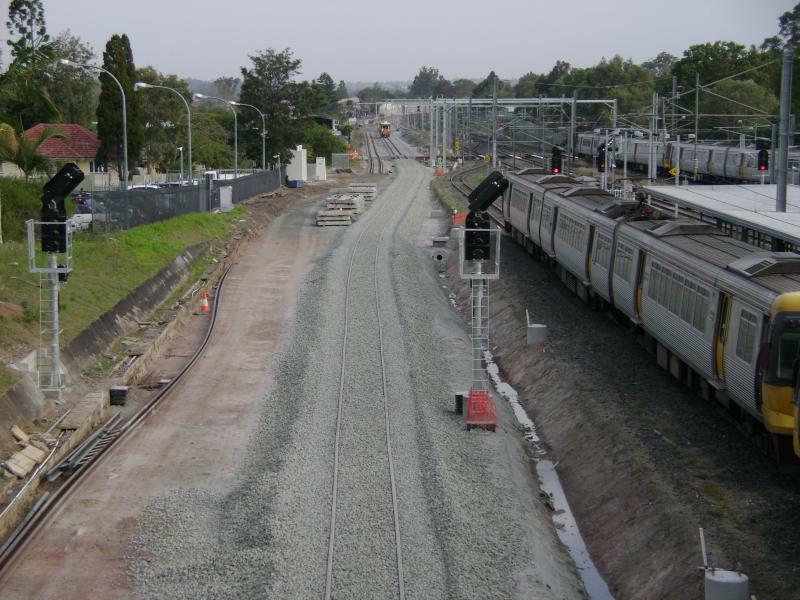 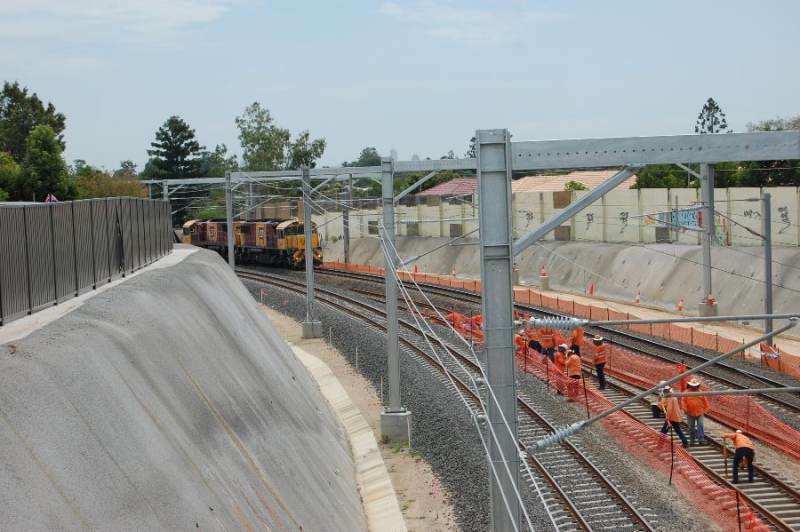 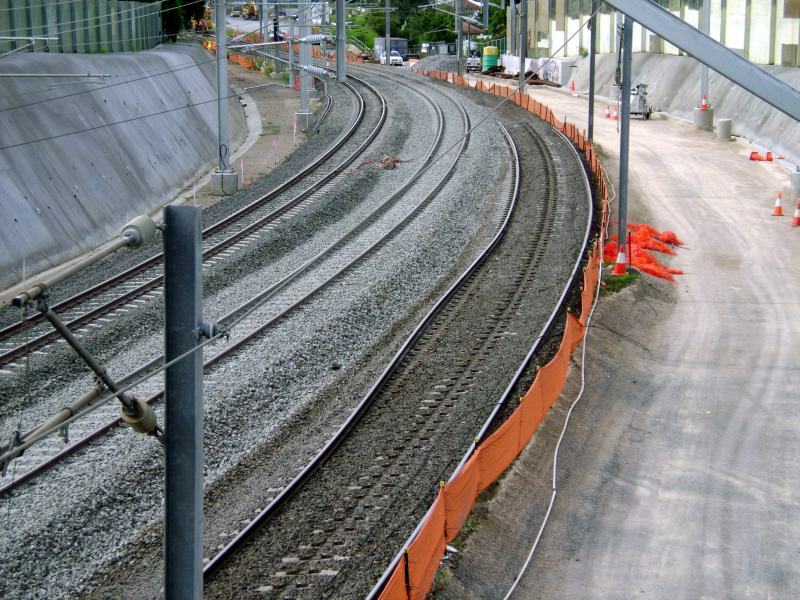 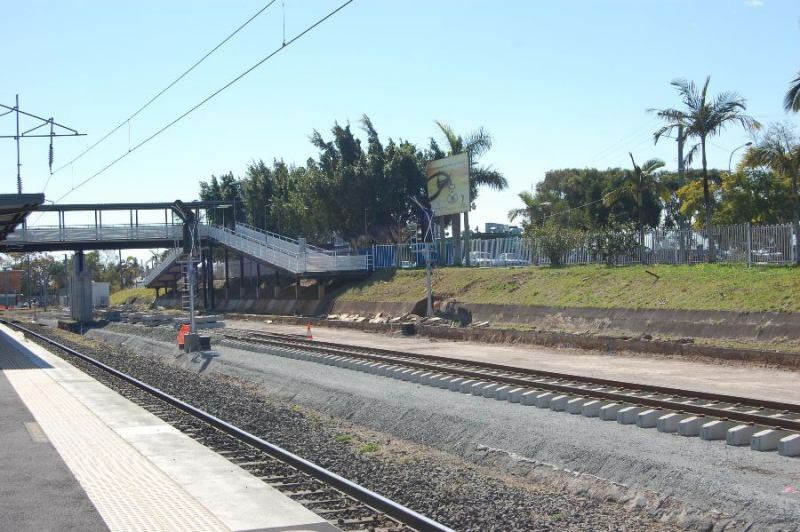 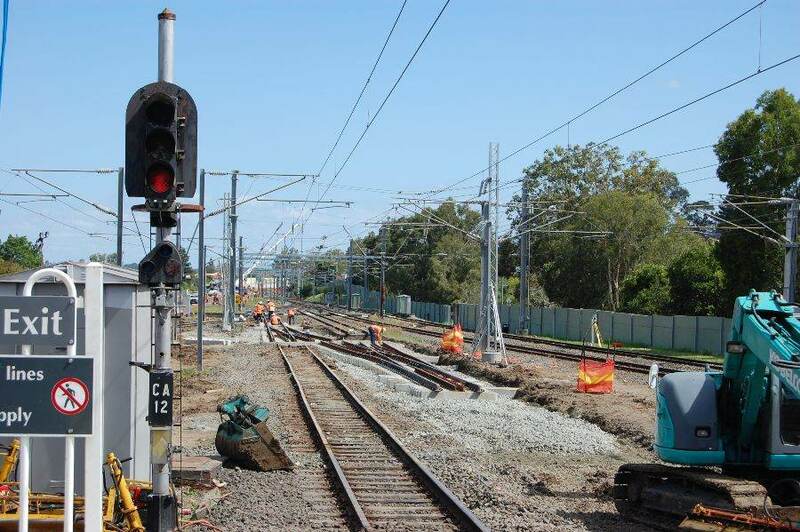 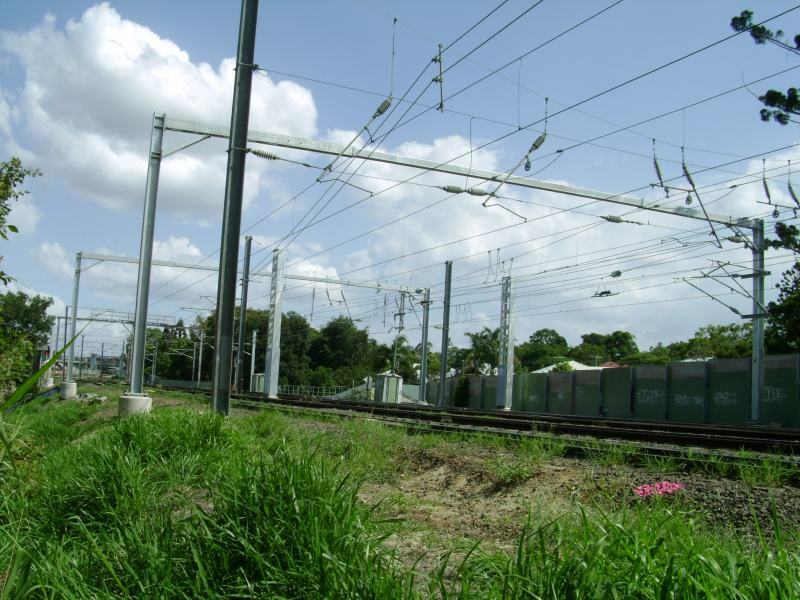 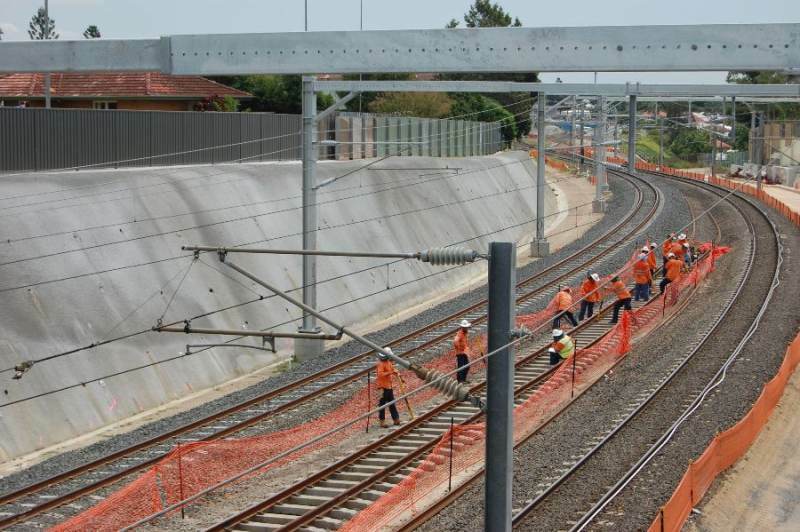 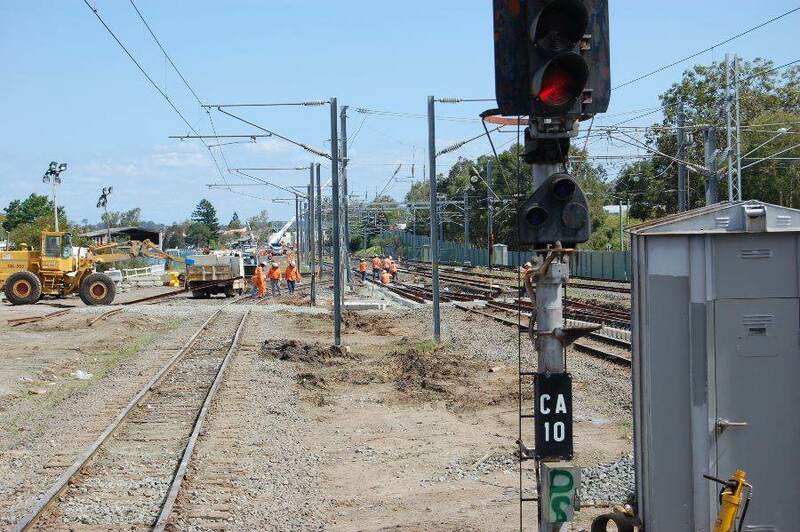 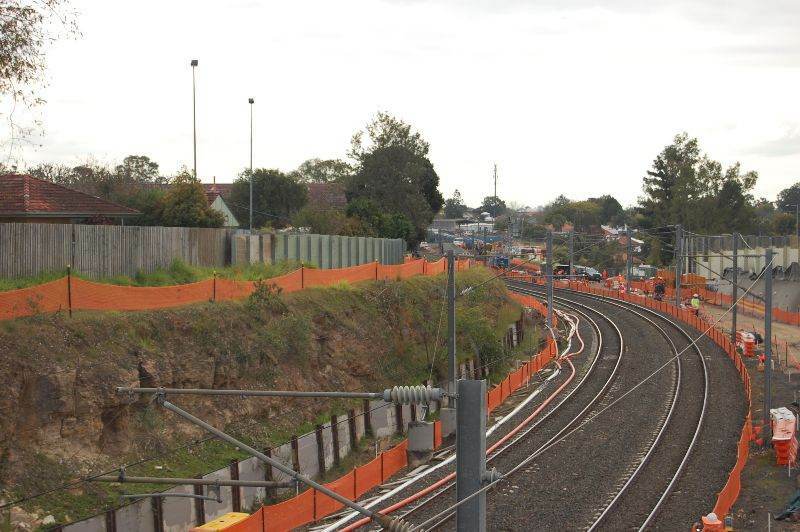 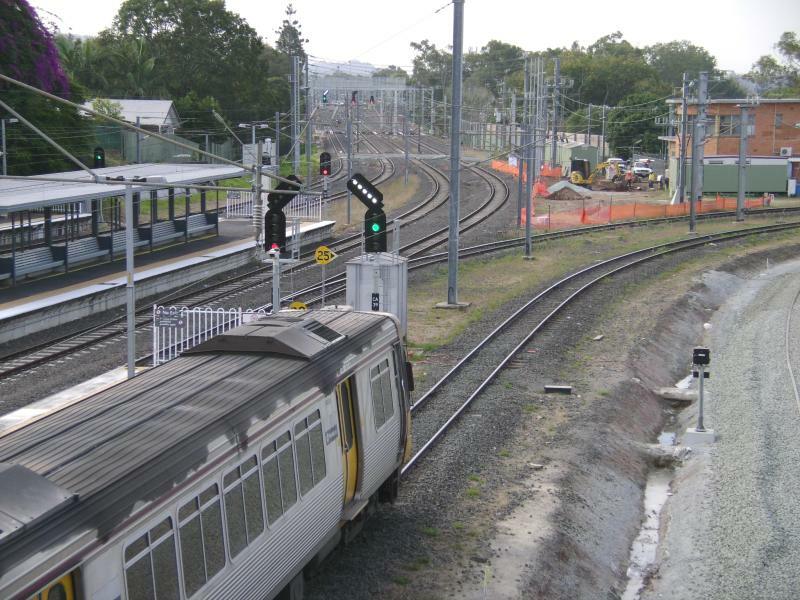 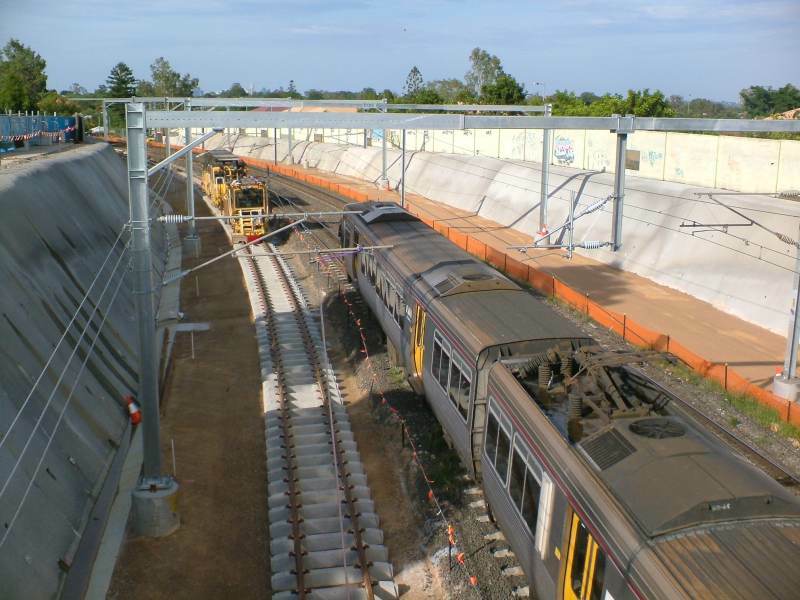 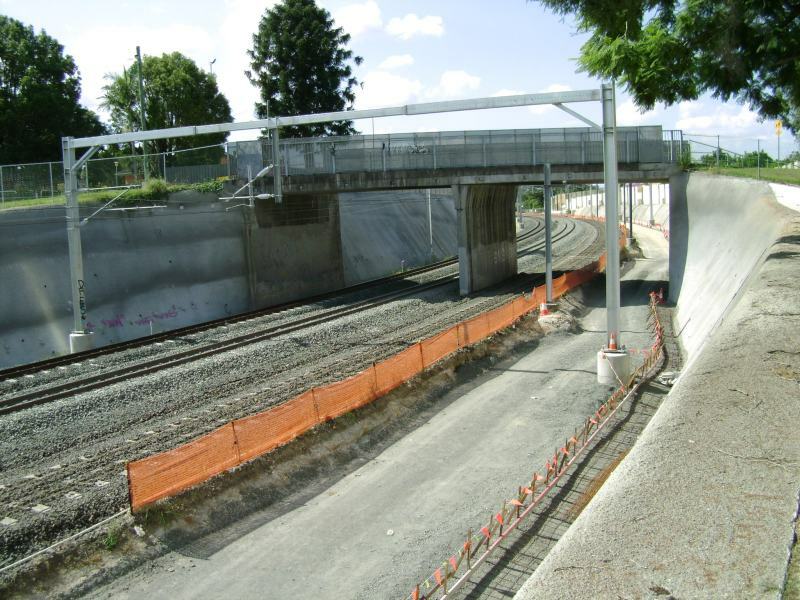 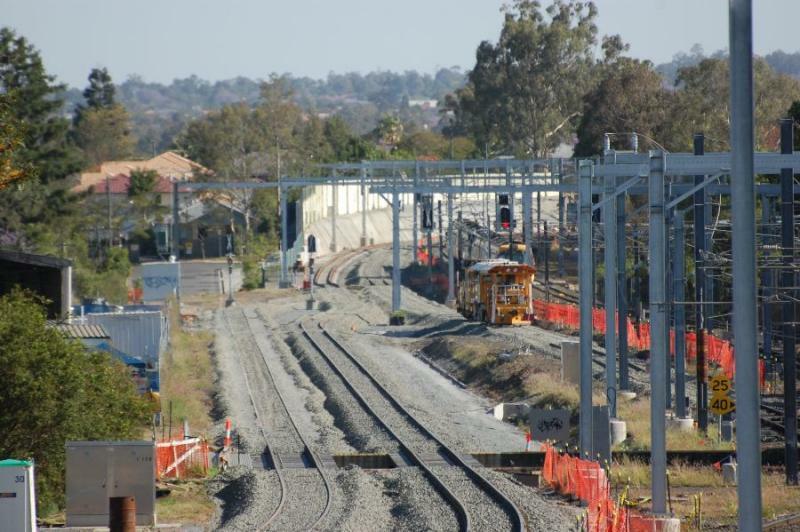 To complete the project by wireing the fourth track and building the fourth platform at Oxley as part of the current project has been estimated to cost $20 million. 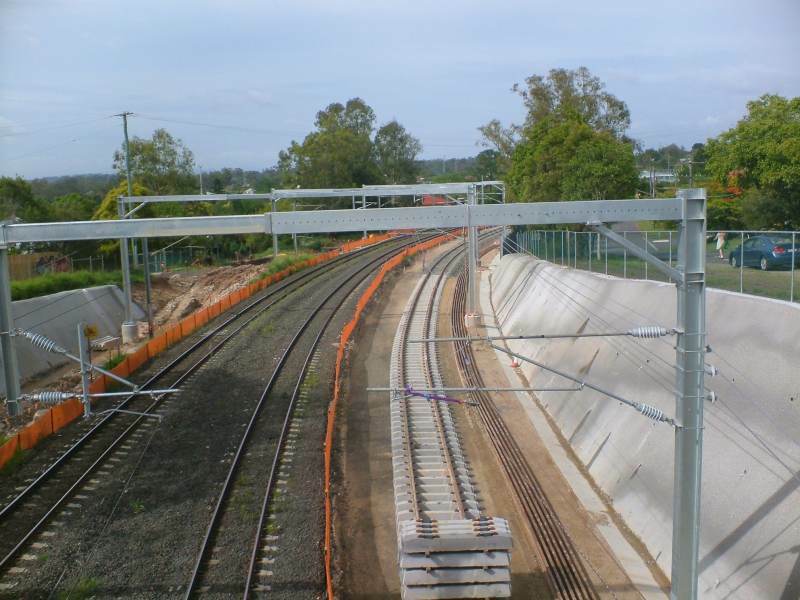 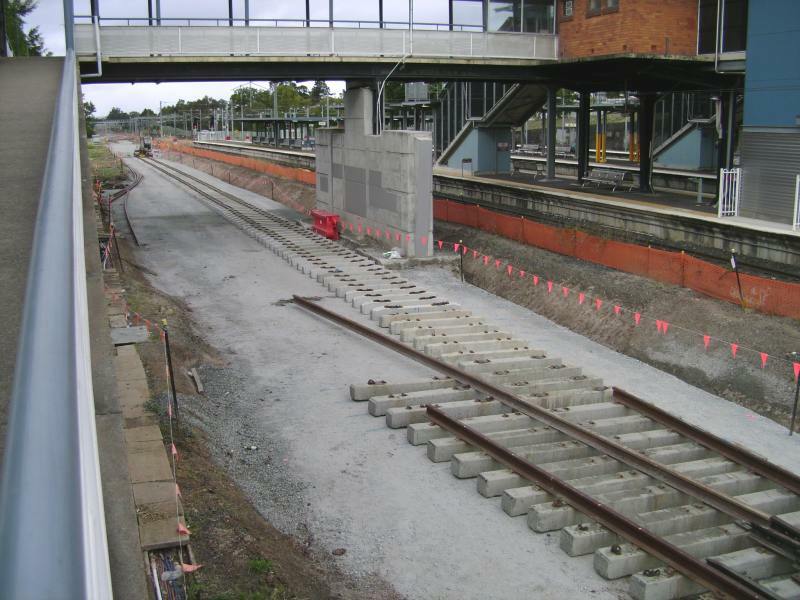 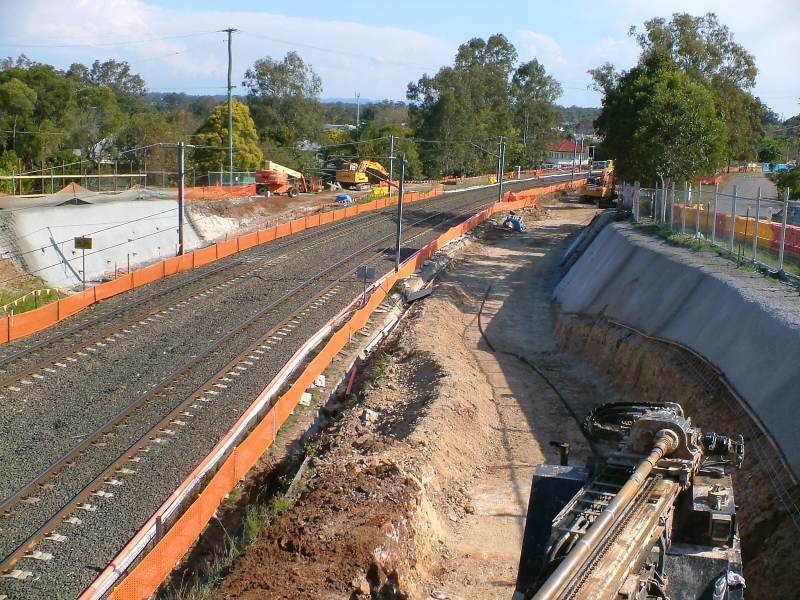 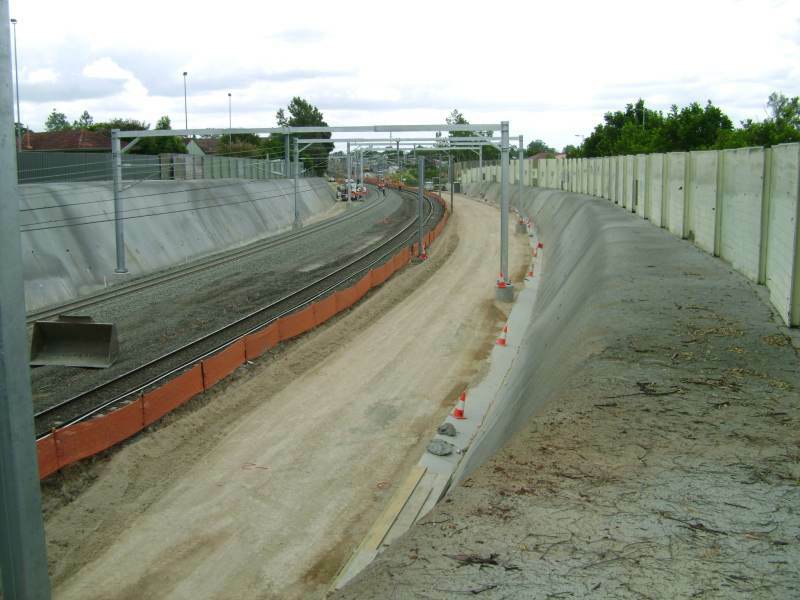 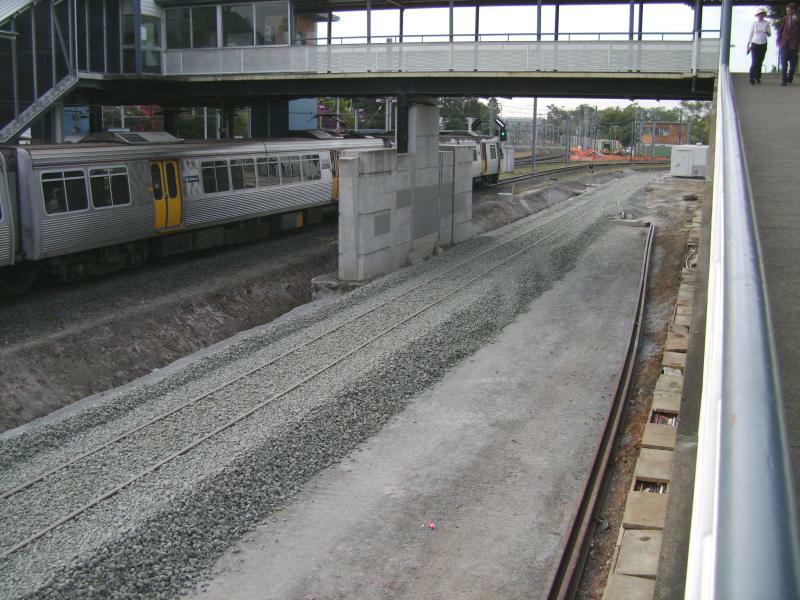 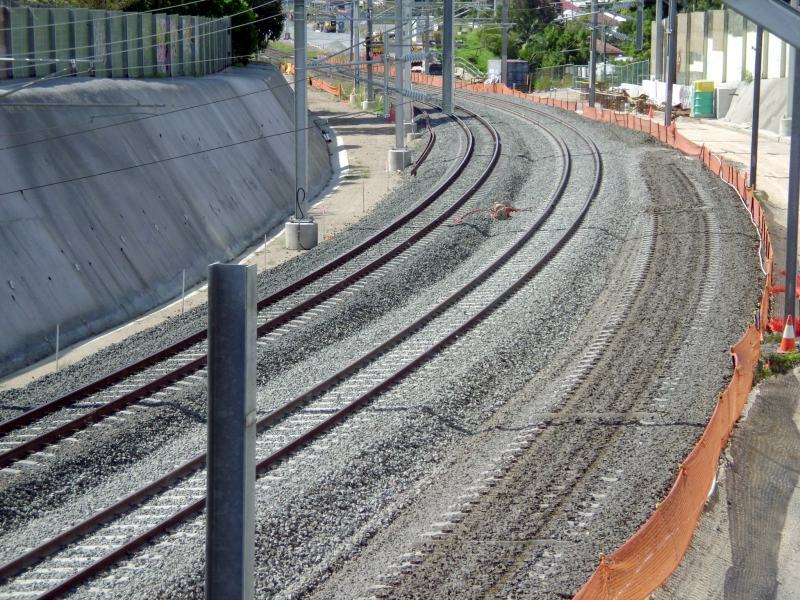 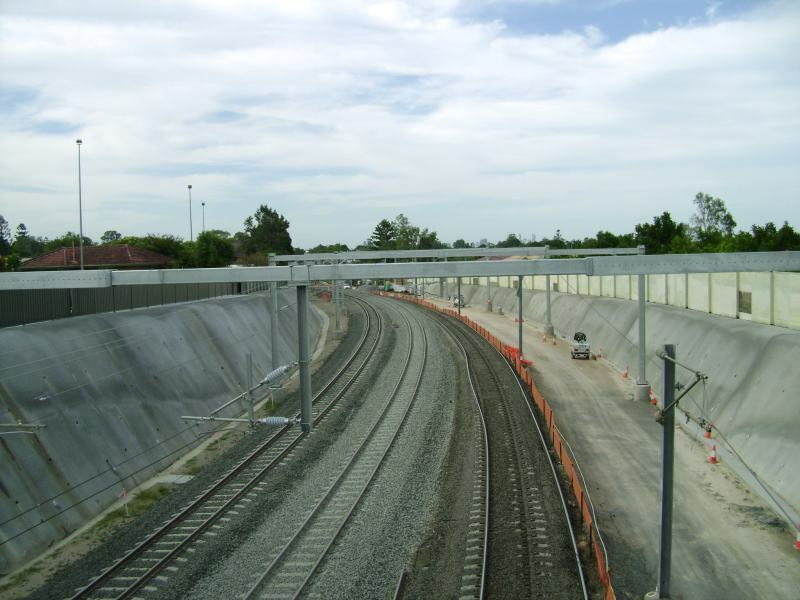 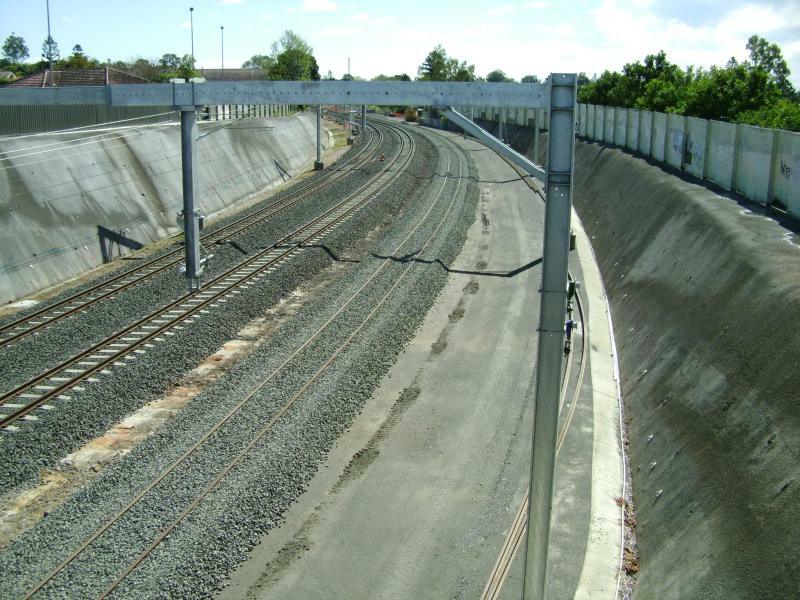 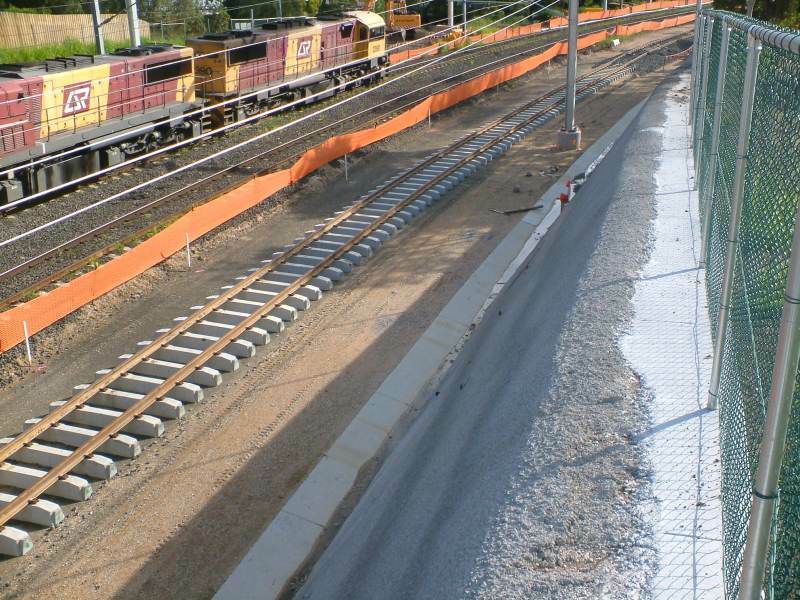 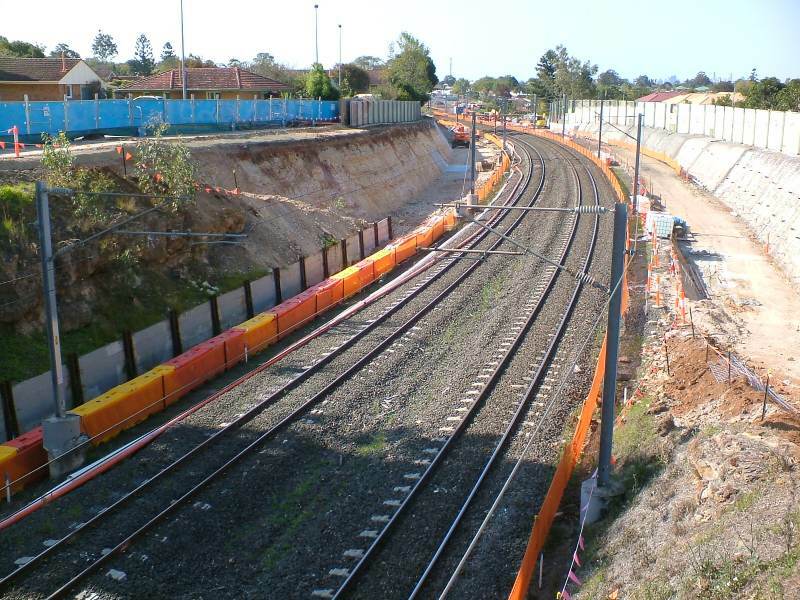 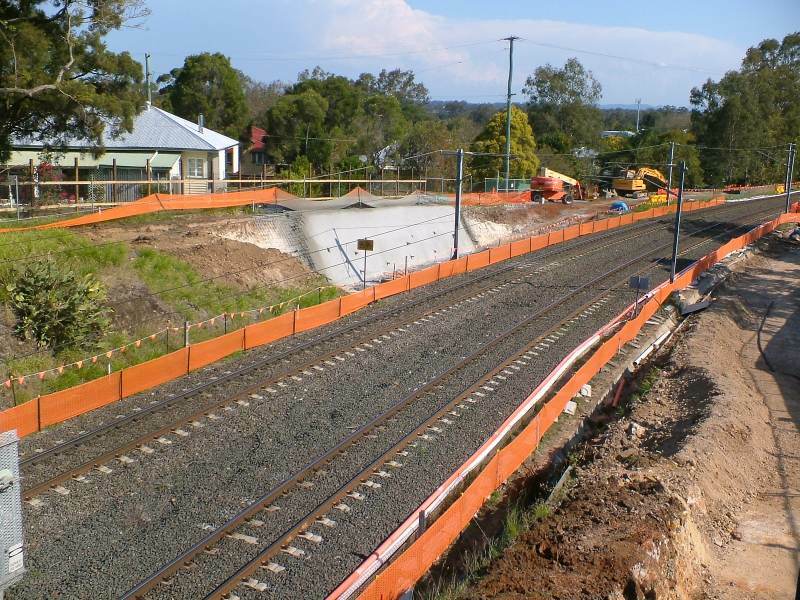 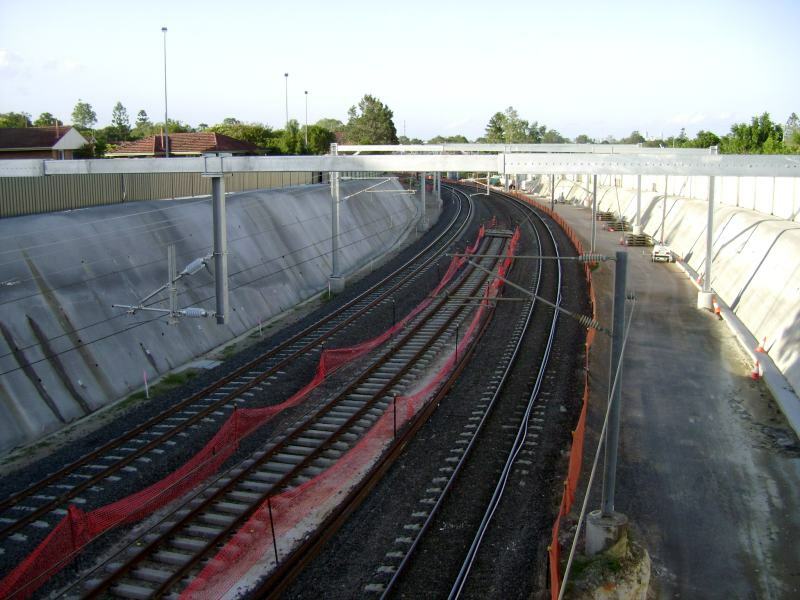 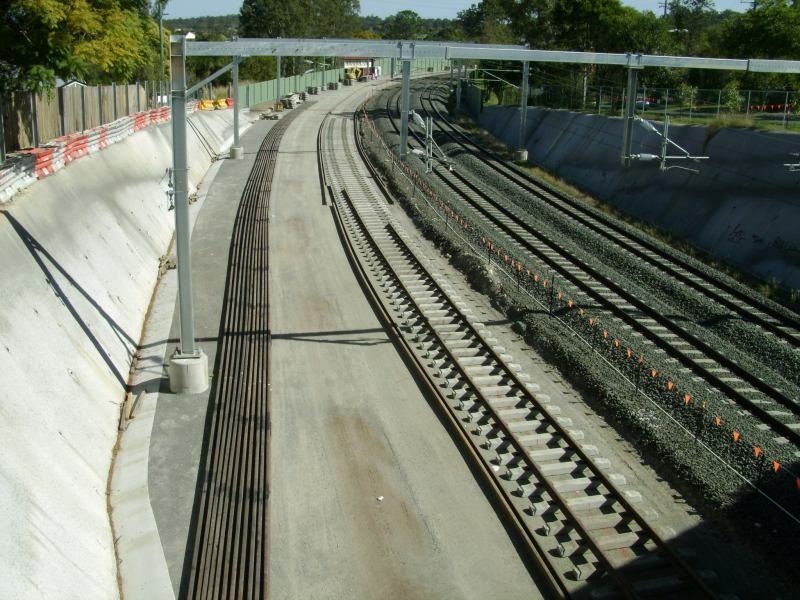 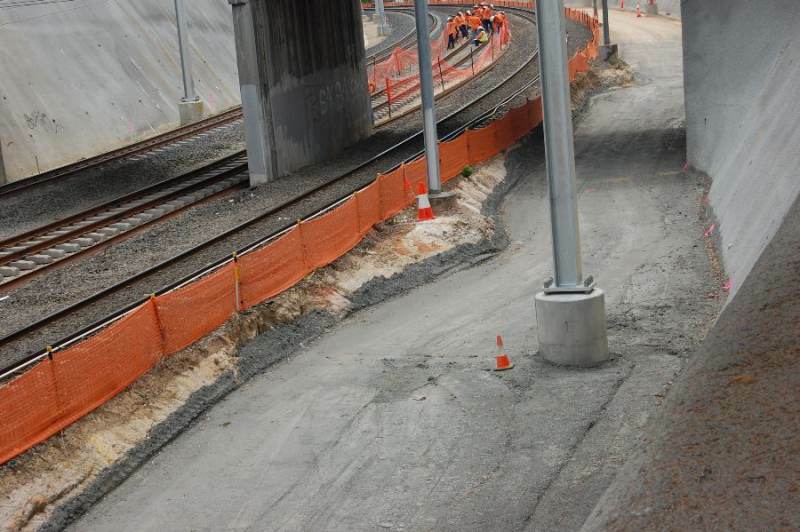 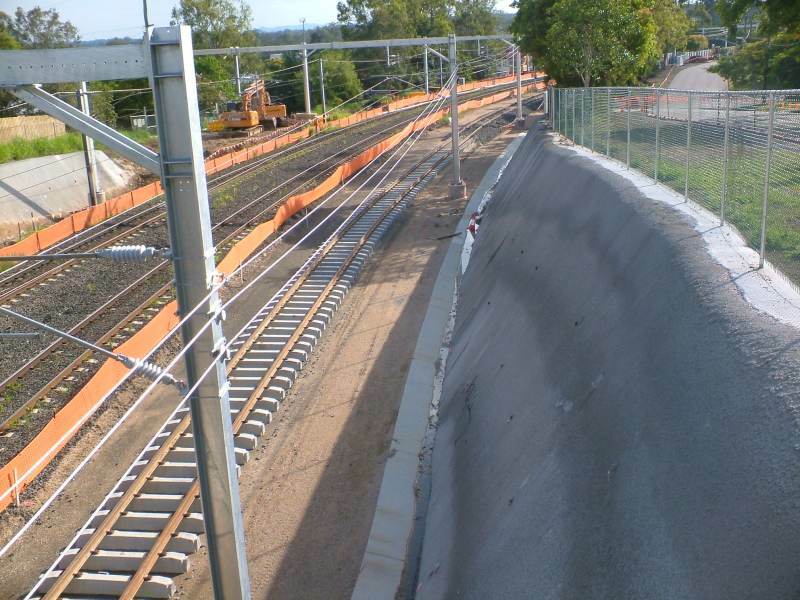 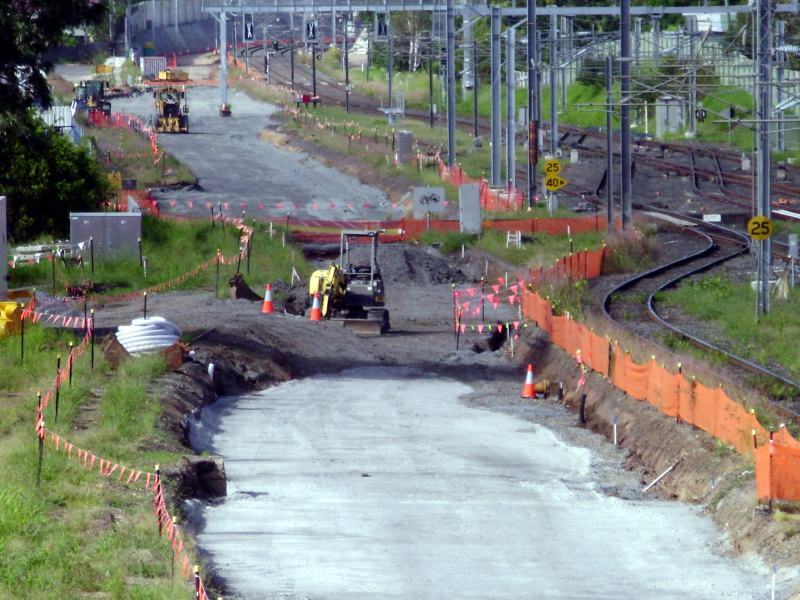 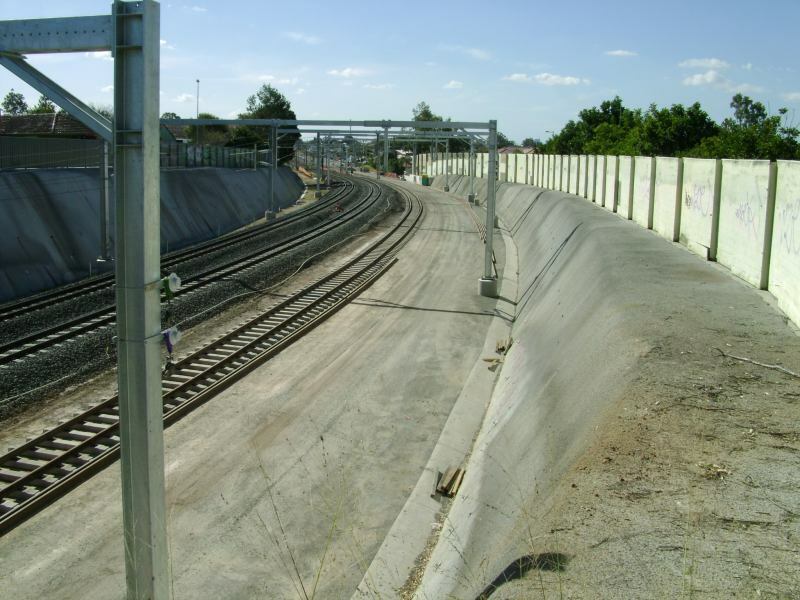 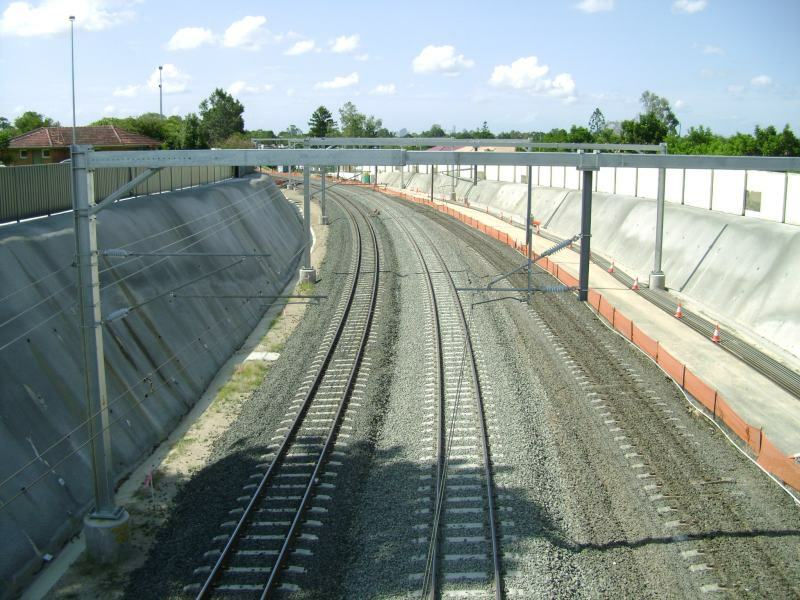 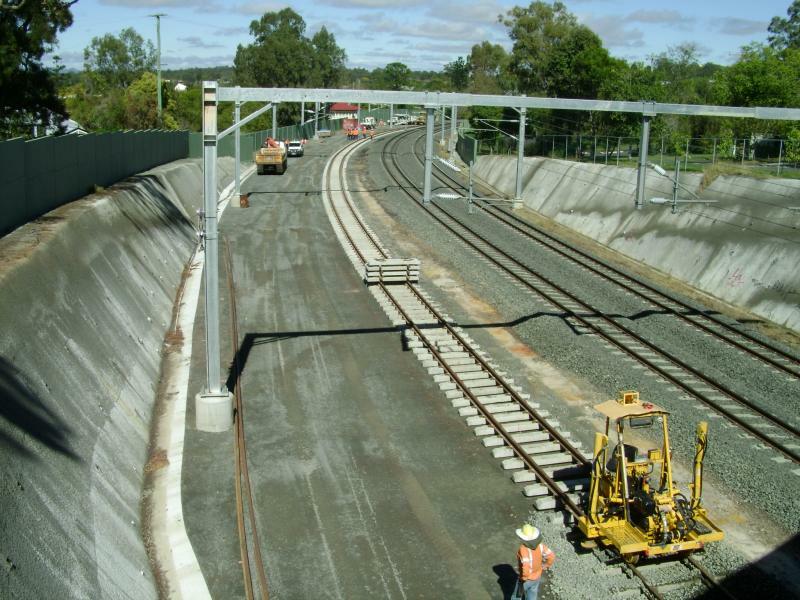 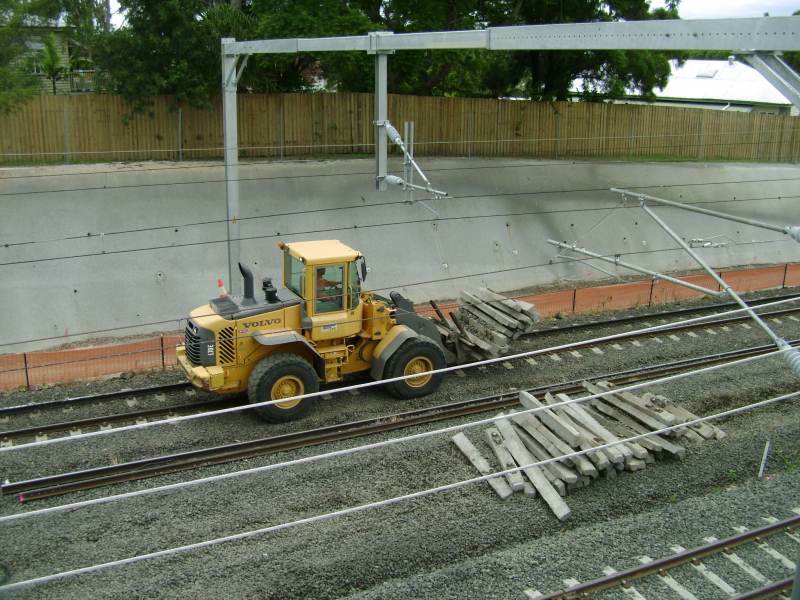 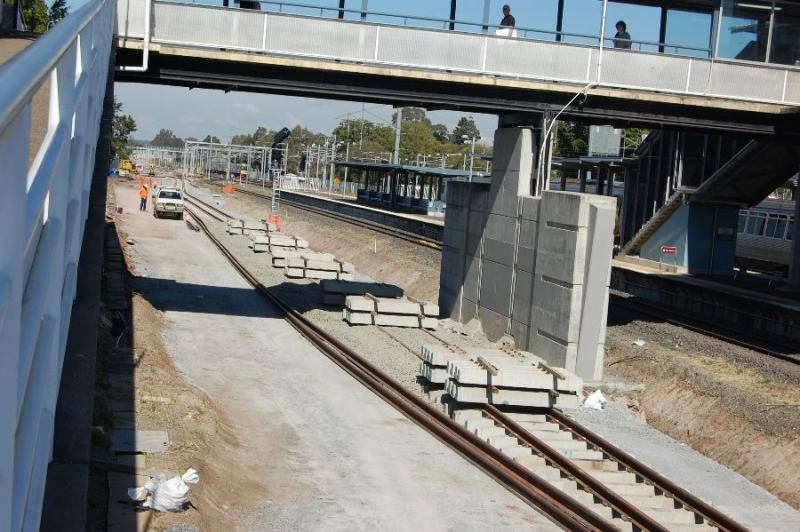 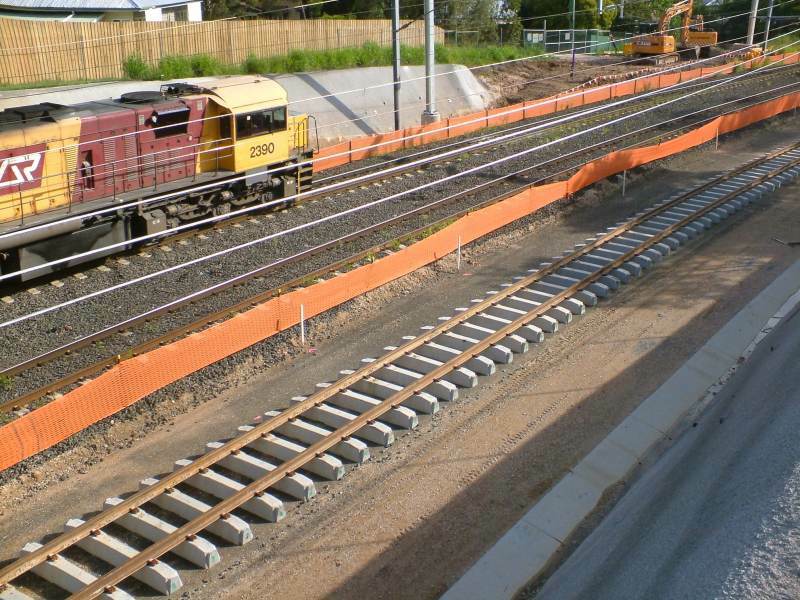 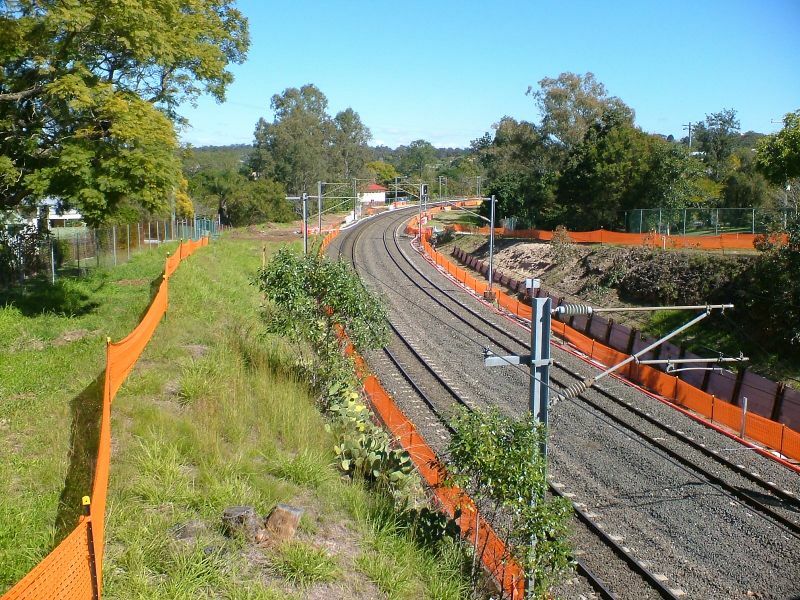 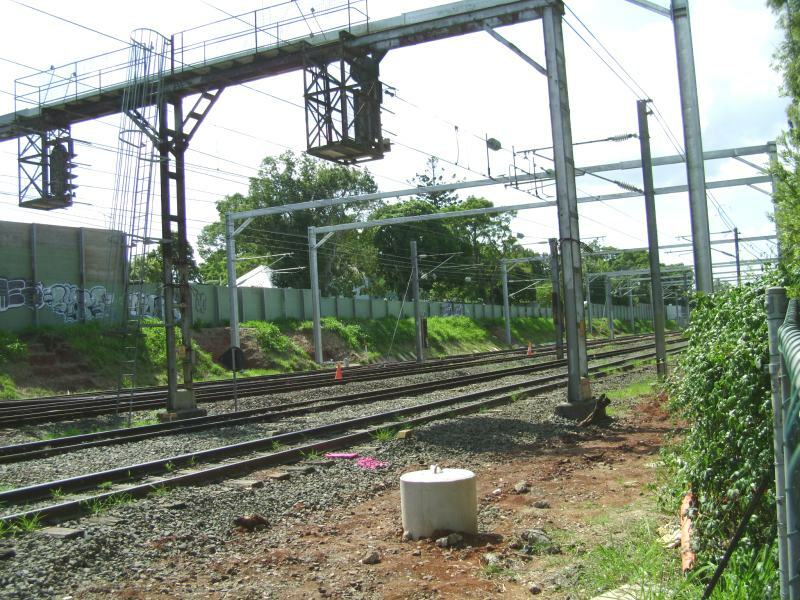 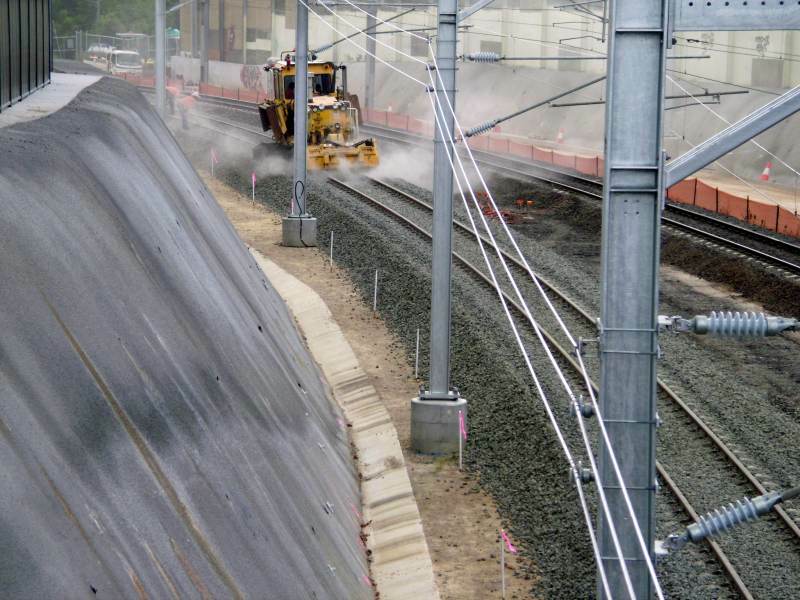 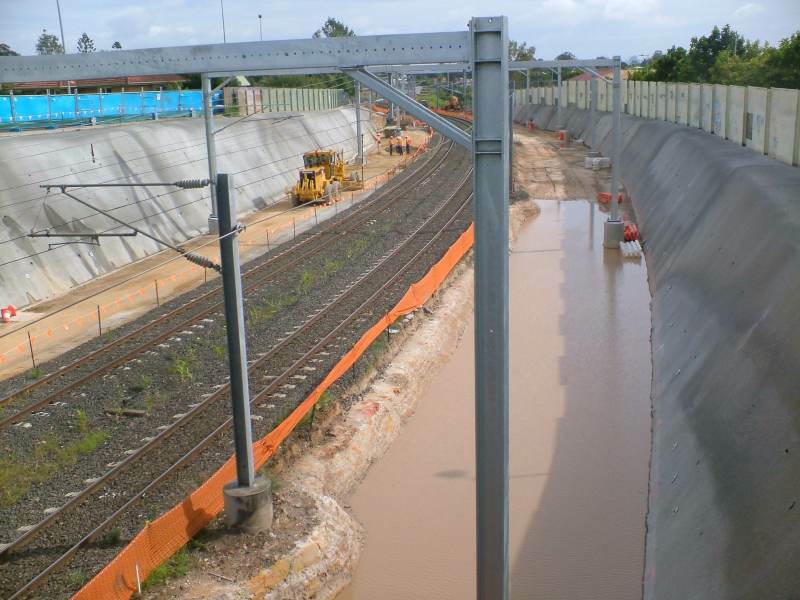 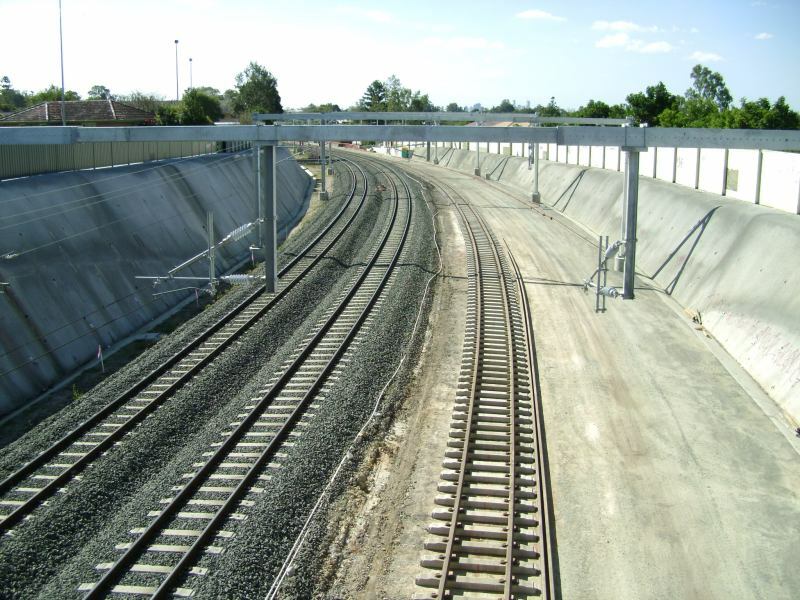 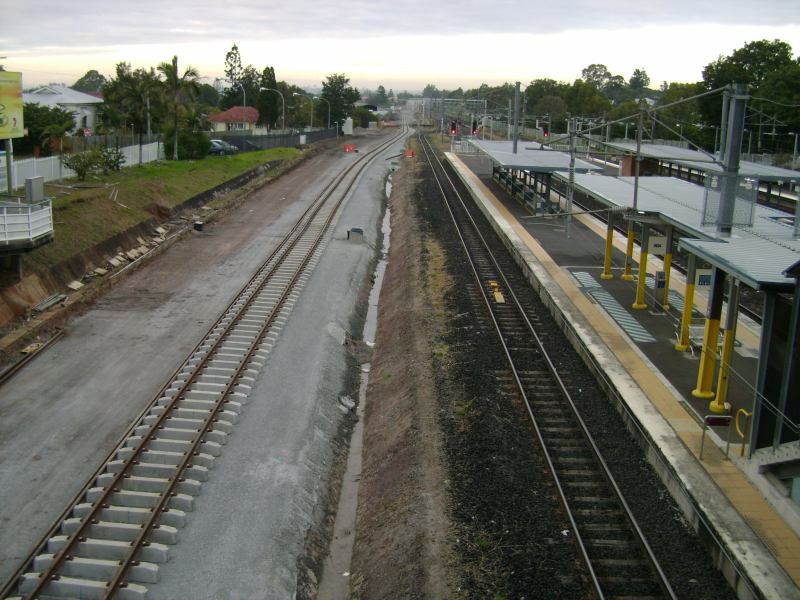 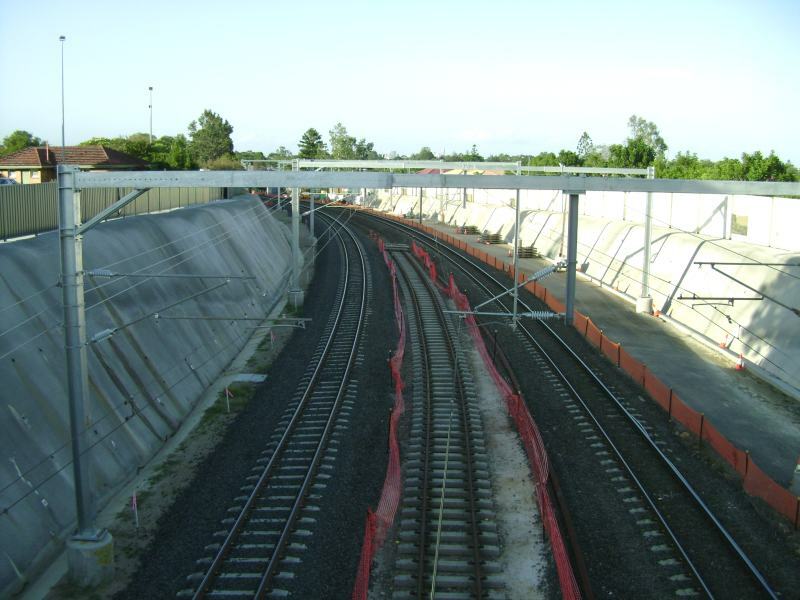 It has been estimated that the costs of setting up alone to restart the project will exceed $17 million and by 2015 the costs for wireing the fourth track and providing the platform at Oxley will have risen to $60 million plus more so the cost of $20 million to do the job now as part of the current project will have risen to at least $77 million, another example of the economic skills of the current government and the abilities or lack of them of those planning for the transport infrastructure needs of South East Queensland. 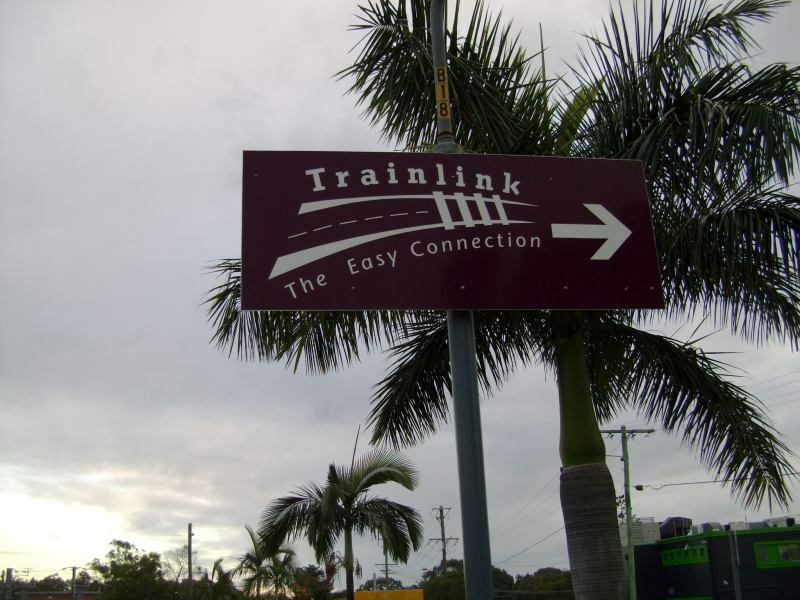 So, yet another place in the network which timetabling has to consider? 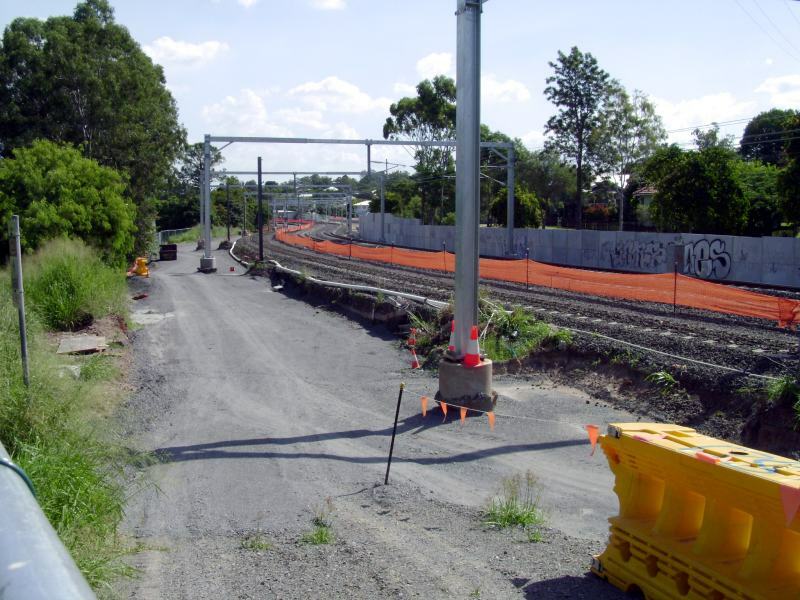 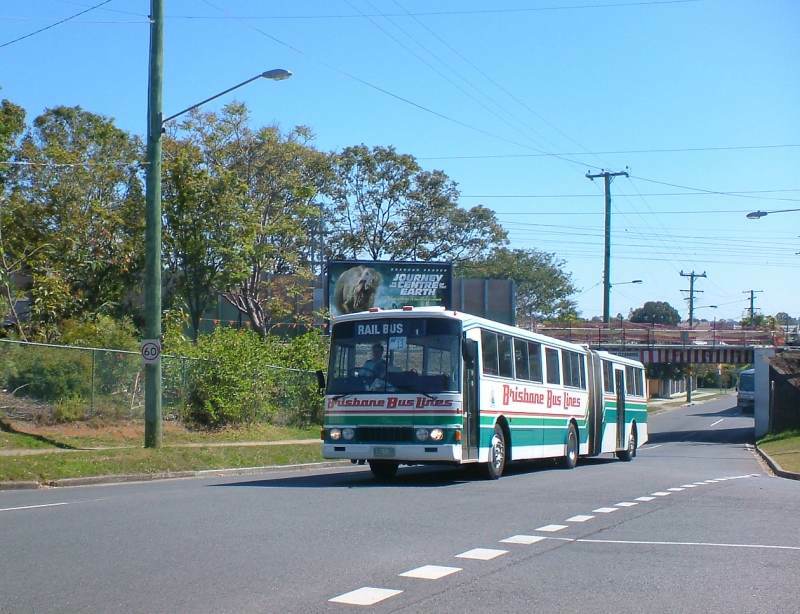 Sydney's rail clearways plan was largely an effort to keep such places to a minimum. 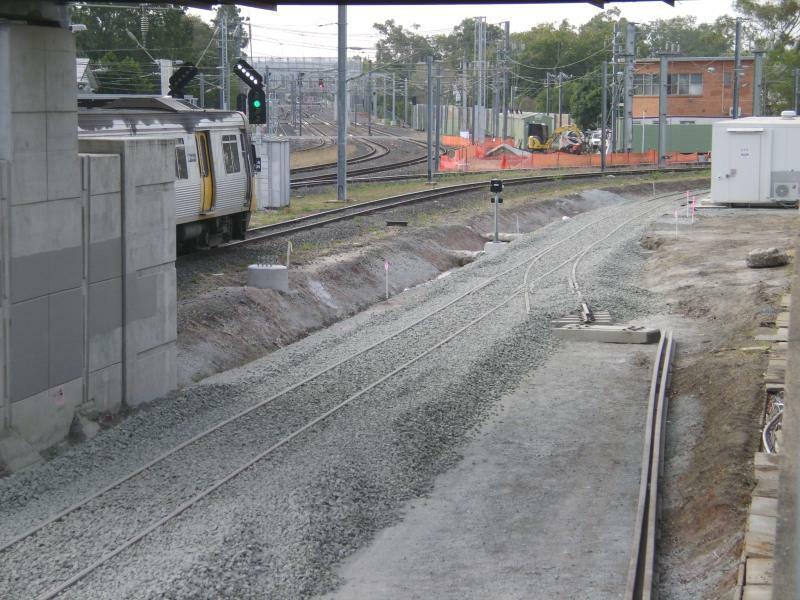 I guess a 4-5min section Darra-Corinda you should in theory be able to run 6tph to Richlands without using the existing pair of tracks. 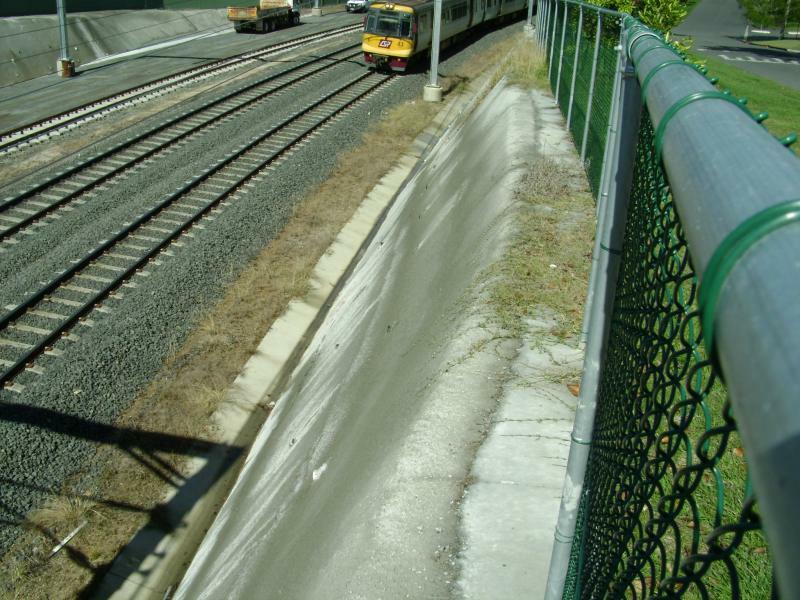 Something I've been wondering for some time. 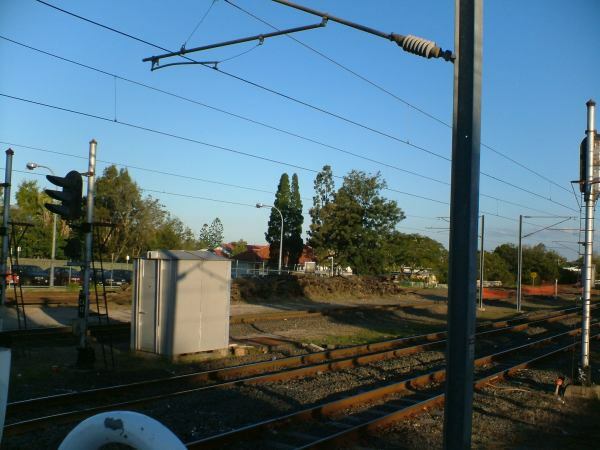 Could it also be that the agreement was to build the line without electrification to ensure uninterrupted freight passage - at least for a certain number of years - after which the Government would have to provide the funding to electrify the line and provide additional platforms? 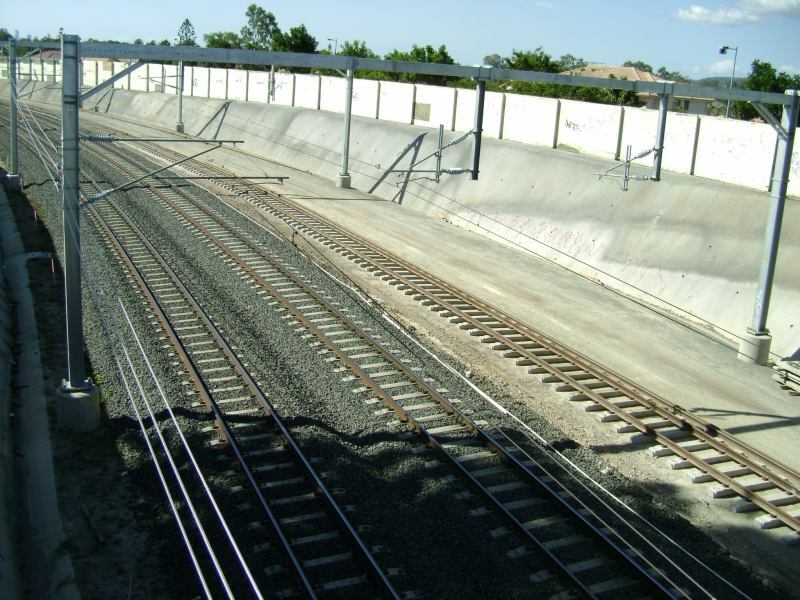 Good reasoning Derwan, but it was the alliance that came up with the 4th track strategy, which I might add is far better than the original proposal. 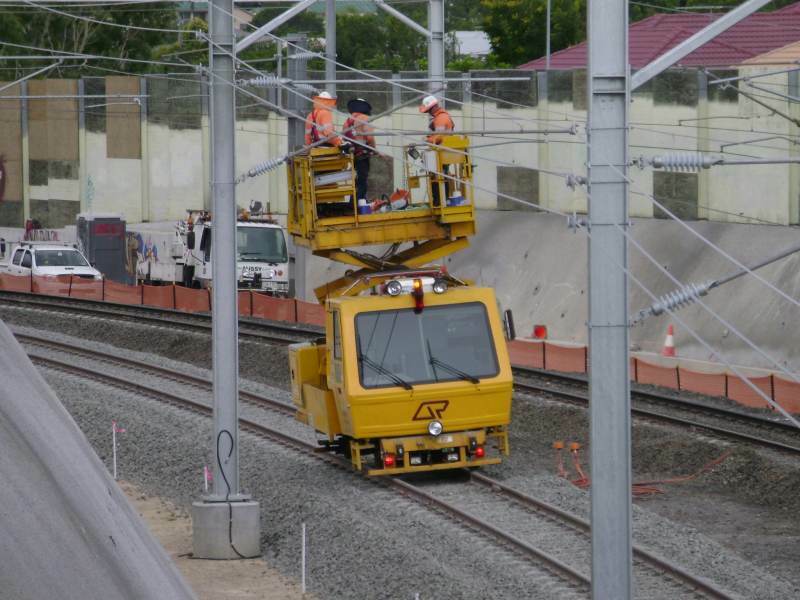 Despite the efforts of many to gain enough funds to do the 4th as an electrified line for the very obvious long term savings it was not possible. 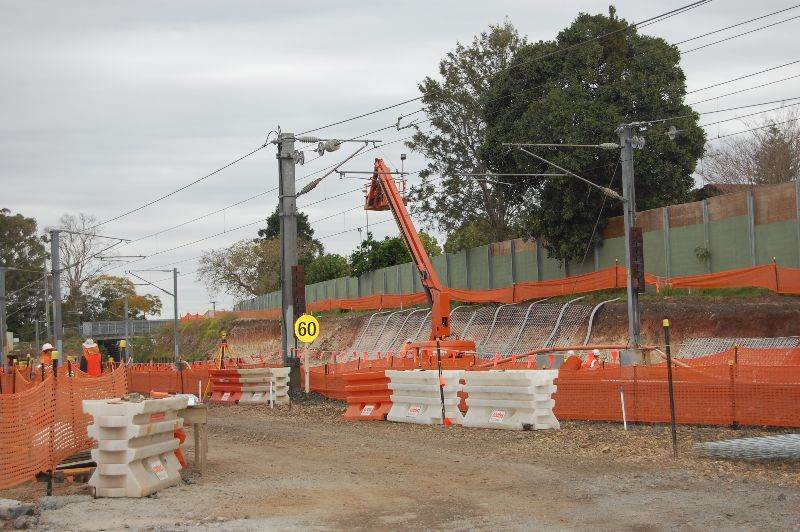 Incidentally there will be a partial electrification of the 4th line from Darra towards Oxley to a point about the brick works I understand. 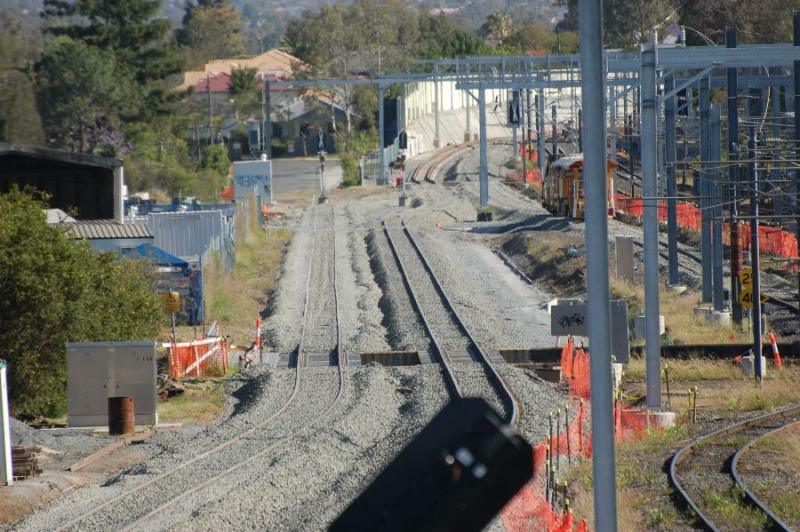 This will be necessary to allow the trains to come over from roads 1 and 2 which will the Richlands (Springfield) roads. 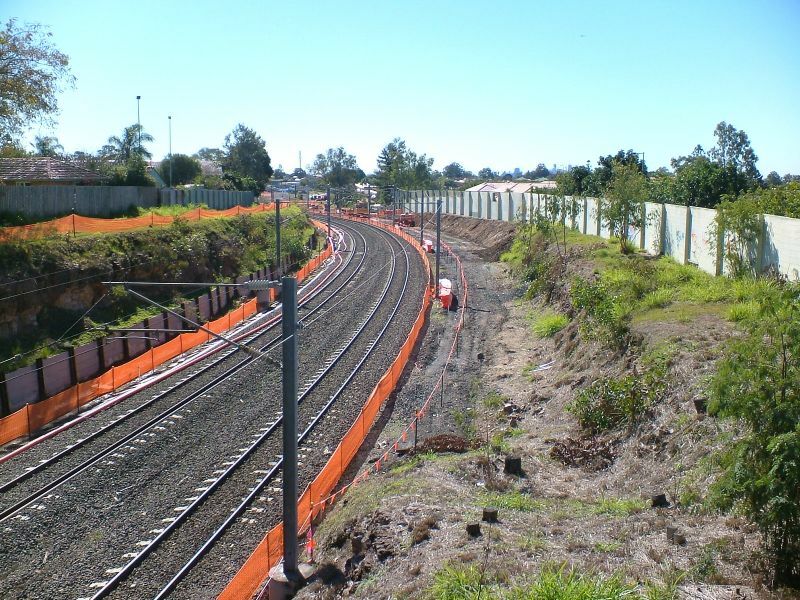 That was part of the original plan as at that point the 4th line down from Darra was to converge to the three lines. 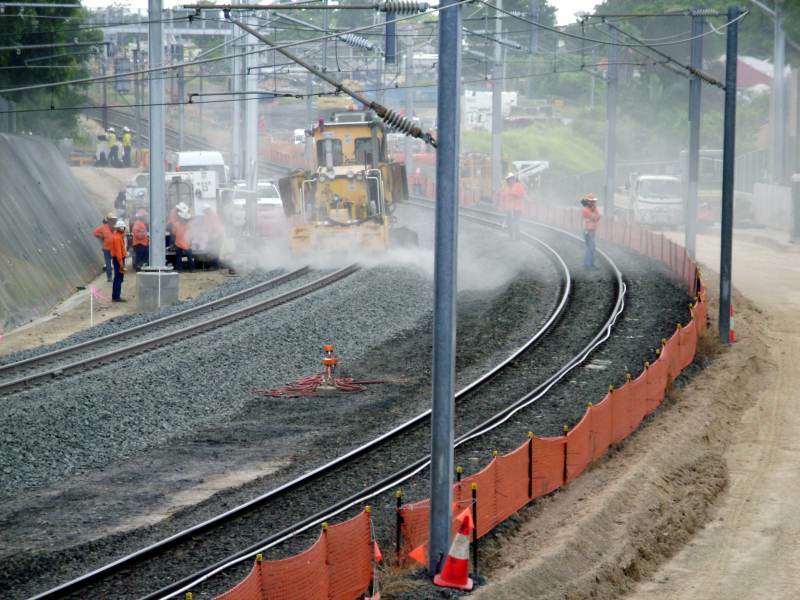 Now the 4th line continues on. 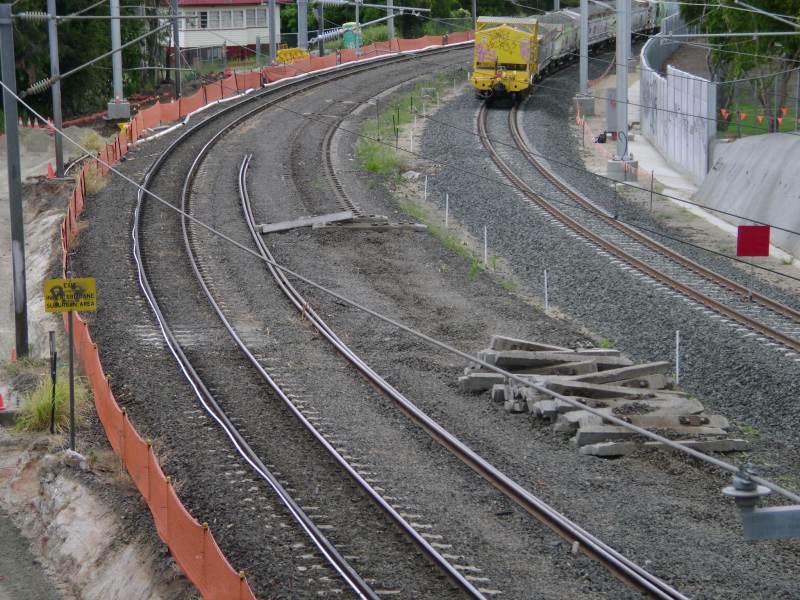 Will be interesting operations though. 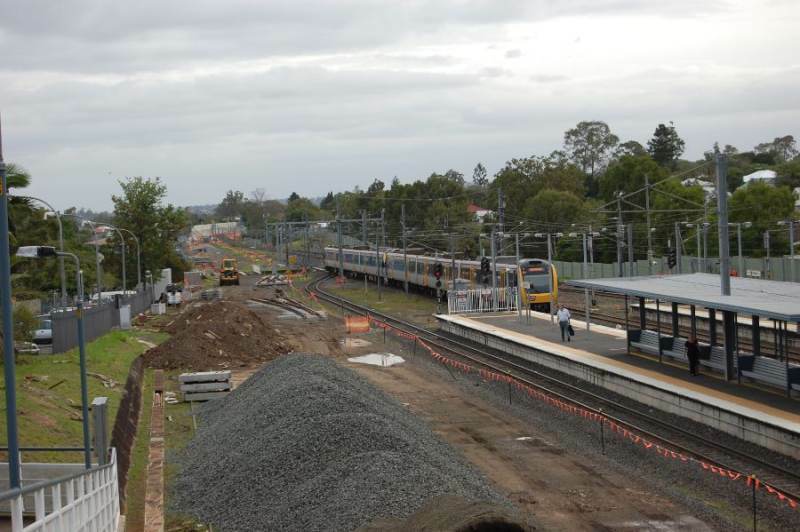 I am sure I will see 4 trains all pass by at once when it opens! 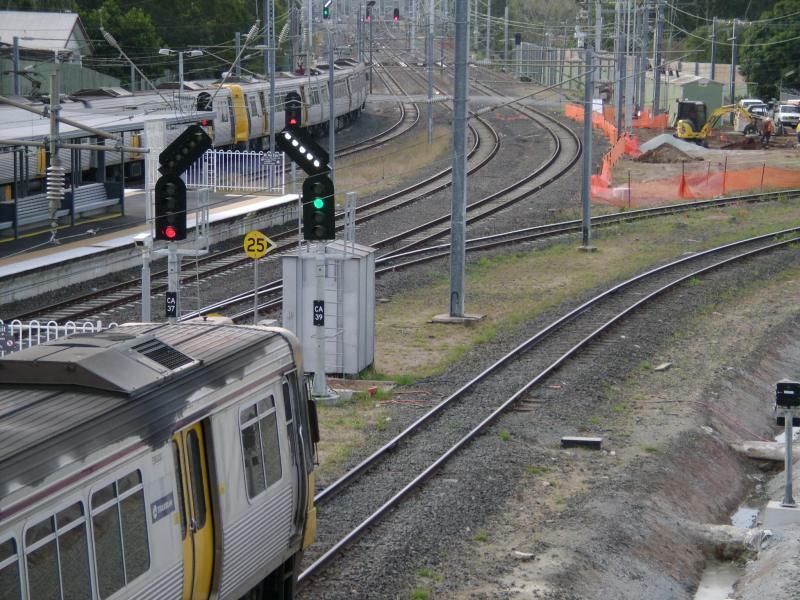 It is time for our freight lines to be given thoer own dedicated, non-conflicted/excluded lines linking our ports, major rail lines and inter-modal sites.